© 2002, © 2017 by Paul Freeman. Revised 6/15/17. 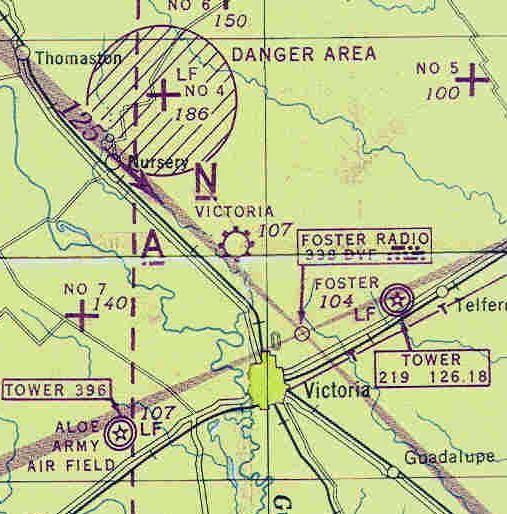 The original Victoria Municipal Airport, as depicted on the July 1945 San Antonio Sectional Chart. 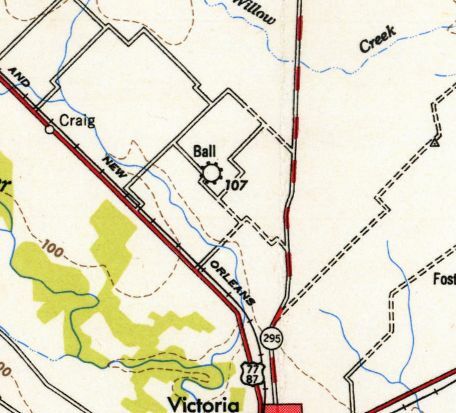 The original airport for the town of Victoria was located northwest of the town. According to Lester Giese, “Ball Airport... originated about 1937. 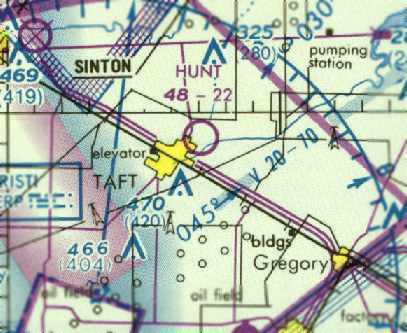 However Ball Airport was not yet depicted on the 1943 San Antonio Sectional Chart. The earliest depiction which has been located of this field was on the July 1945 San Antonio Sectional Chart. It depicted Victoria Airport as a commercial/municipal airport. having 3 sod, sand, and loam runways, the longest measuring 2,500' north/south. A single 83' x 35' wood hangar was depicted along with some other small buildings on the east side. The field was said to be owned & operated by private interests. 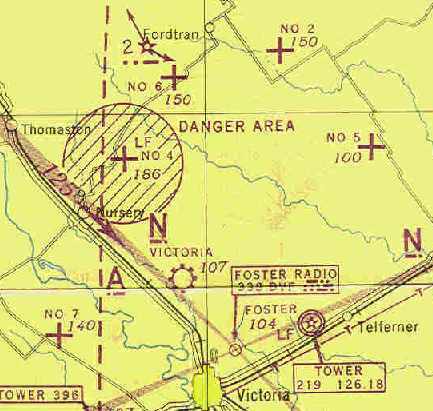 after the much larger Foster AAF to the east of the town was vacated by the military & reused as the new Victoria Airport. 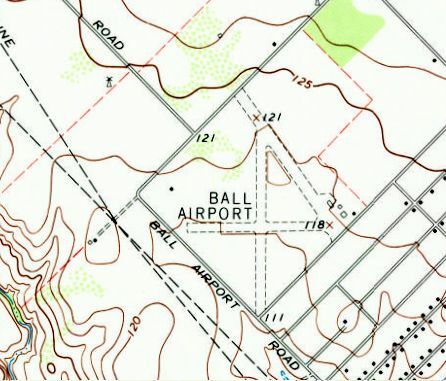 The 1963 USGS topo map shows Ball Airport to have 3 unpaved runways, with a few small buildings on the east side. An 11/11/79 aerial photo shows Ball Airport to have 3 unpaved runways, with a few small buildings on the east side. 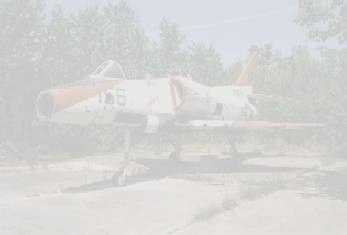 which showed 2 or 3 light single-engine aircraft parked on the east side. and there were no aircraft visible on the field. 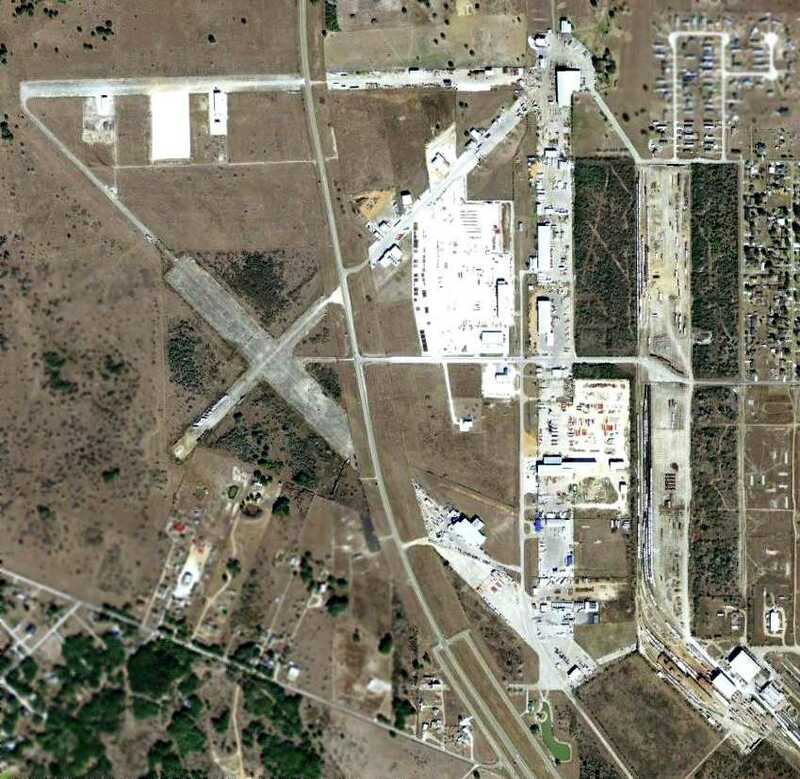 A 2008 aerial view showed no change at the site of Ball Airport. but the 3 hangars remained intact on the east side. 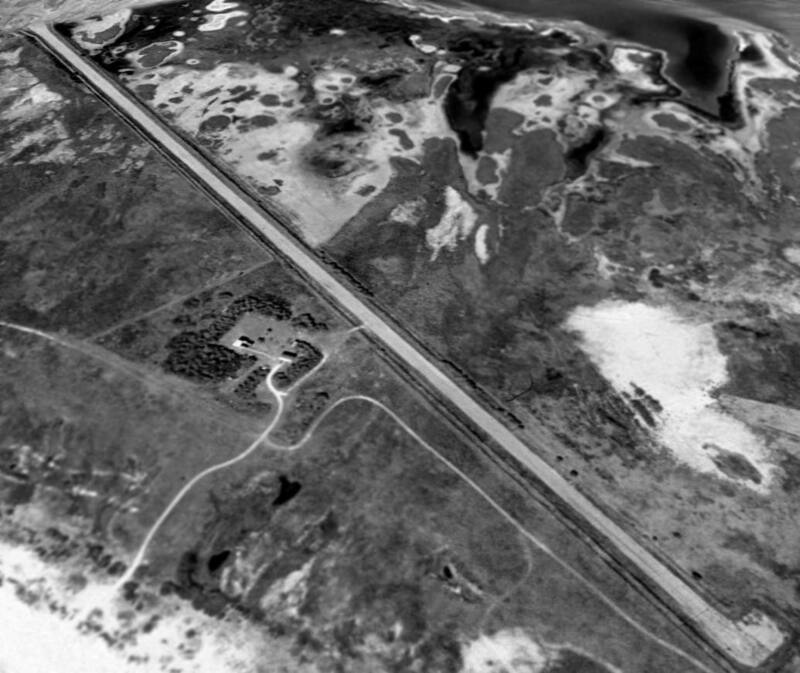 A 2011 aerial view showed that a street had been constructed over the southern portion of the Ball Airport site. and 1 former hangar remained standing on the east corner of the airport site. The site of Ball Airport is located north of the intersection of Malette Drive & Ball Airport Road, appropriately enough. 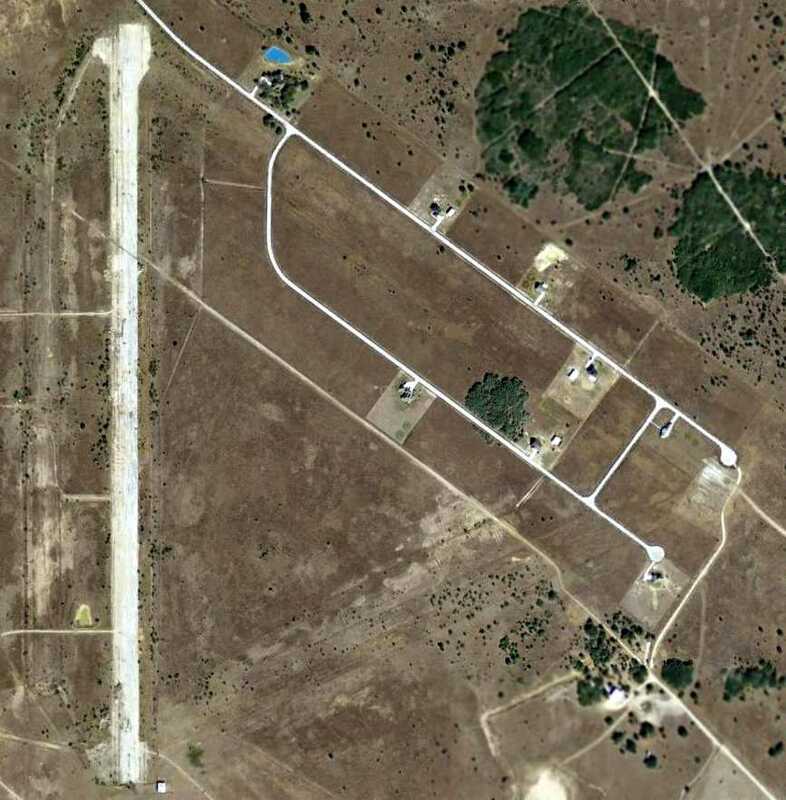 Thanks to Lester Giese for pointing out this airfield. 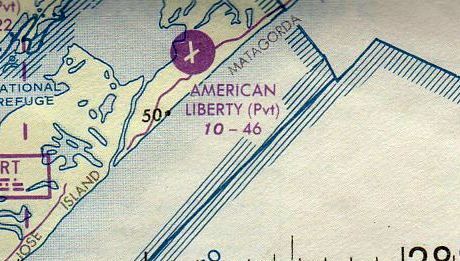 American Liberty Oil Company Airport, as depicted on the 1964 San Antonio Sectional Chart. The date of establishment of this airfield has not been determined. 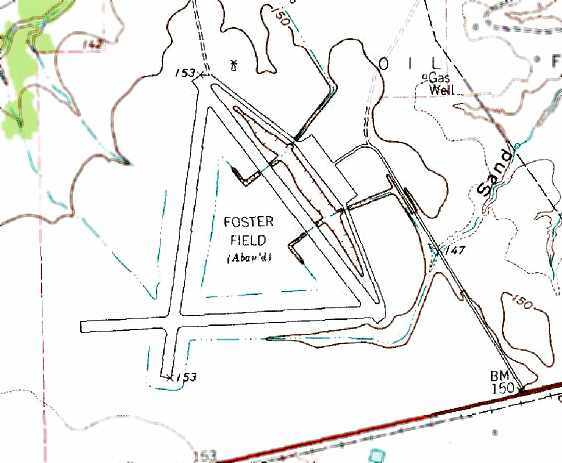 However, this airfield was not yet depicted on the 1960 USGS topo map. was on the 1964 San Antonio Sectional Chart. It depicted American Liberty as a private airfield with a 3,700' unpaved runway. which depicted the field as having 2 paved runways & a ramp & a cluster of buildings on the west side. The airfield had presumably been built as a retreat/resort for the oil company. 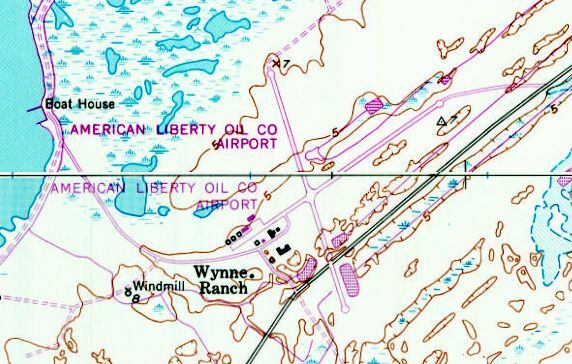 The 1973 USGS topo map depicted the American Liberty Oil Company Airport as having 2 paved runways, with a ramp & several buildings on the west side. was on the 1976 Brownsville Sectional Chart (courtesy of Jim Hackman). It depicted American Liberty as a private airfield having 2 paved runways, with the longest being 4,600'. and Wynne agreed to have the operation moved to his estate at the western (southwestern) end of Matagorda Island, about 34 miles down the coast. 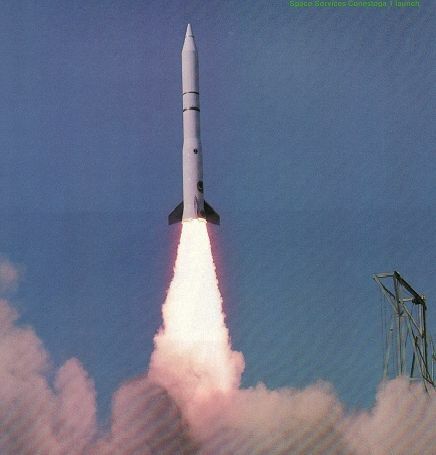 The Percheron rocket exploded on the launch pad during an engine test in 1981 (on Wynne estate, Matagorda Island) and the company regrouped with another plan. complete with a luxurious Convair (had DC-3 before that) and this airport was used to bring in people & supplies to the estate, which was quite luxurious. In 1982, it was a busy airport with scores of planes & helicopters landing there. Deke Slayton would also fly his own Cessna there & was known to put on a show at times... much to the chagrin of FAA officials onsite at the time. 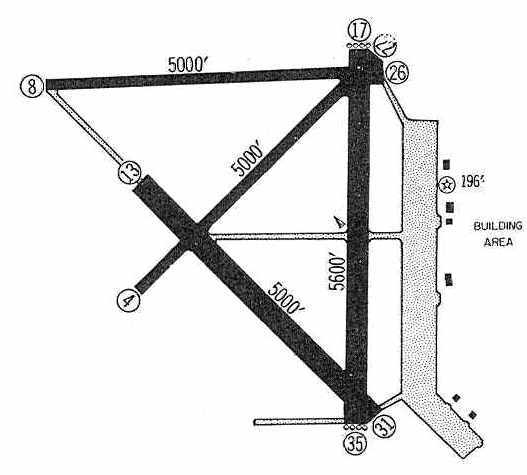 Bill continued, “The remains of the Percheron pad are located about 3.98 miles northeast of the center of the existing runway(s) up the road that runs the length of the island. The platform is on the north side of the road & there is a small (square) pond opposite it on the south side of that road. After the explosion, Space Services & Gary Hudson parted ways & SSI hired Deke Slayton, former astronaut, to head the program. They decided to go with a solid-fueled rocket this time (Percheron was liquid-fueled) and successfully launched Conestoga I the next year in 1982 from a different site. This new pad was the opposite direction from the runway, a little over 3 miles southwest of the runway. There are actually 2 visible ruins there... one is the ruins of the rocket assembly building (2.8 miles from runway) and the other is the concrete pad itself (3.98 miles). 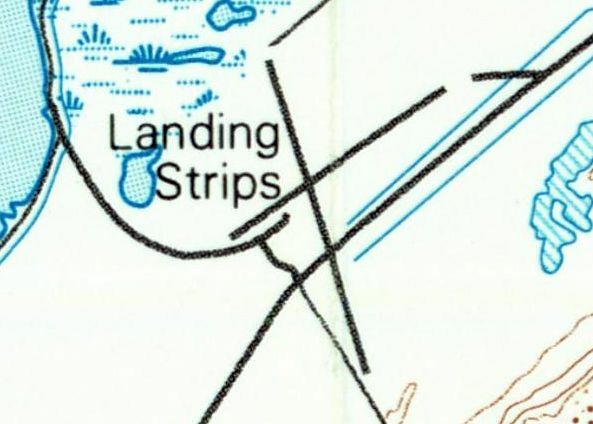 but it was labeled generically as “Landing Strips”, which may indicate that the airport was closed by that point. as that is how it was labeled on the 2009 Brownsville Sectional Chart. It was depicted as having 2 paved runways, with the longest being 4,600'. 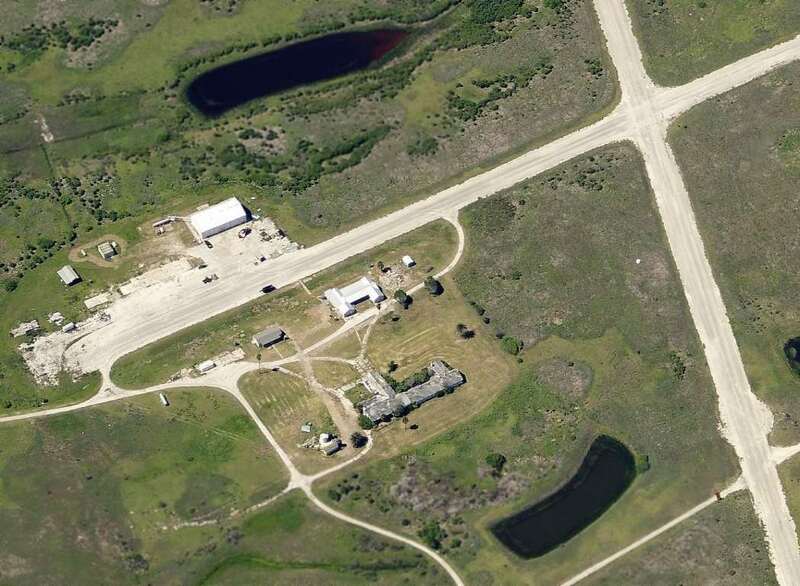 A circa 2010 aerial view looking north at the hangar & other buildings on the west side of the Aransas National Wildlife Refuge Airfield. showed the runways & buildings to remain intact, though deteriorated. 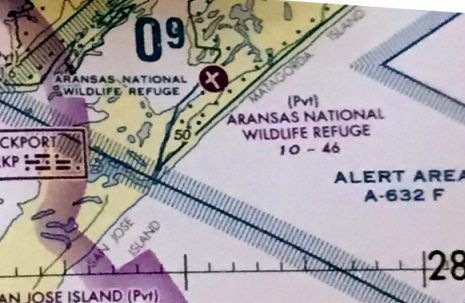 As of 2014, road maps showed the Aransas National Wildlife Refuge Airfield to be within the bounds of the Matagorda Island Wildlife Refuge. 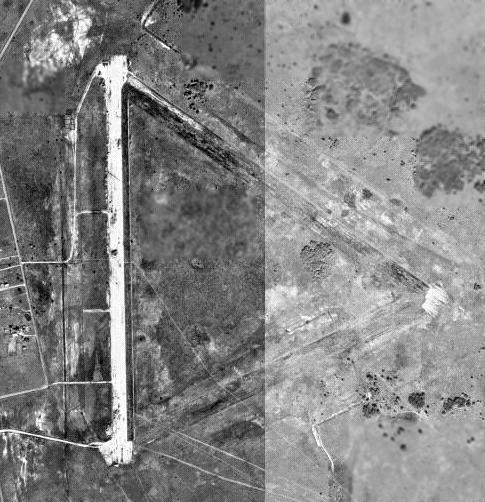 as 2014 aeronautical charts depicted it as an abandoned airfield. Bill Hedrick reported in 2015, “Matagorda Island is now federal land under the US Fish & Wildlife Department & a special permit to visit the island is required & access is by boat only. Aransas Pass Airport, as depicted in the 1970 TX Airport Directory (courtesy of Ray Brindle). as it was not yet depicted on a 1955 USGS aerial photo. 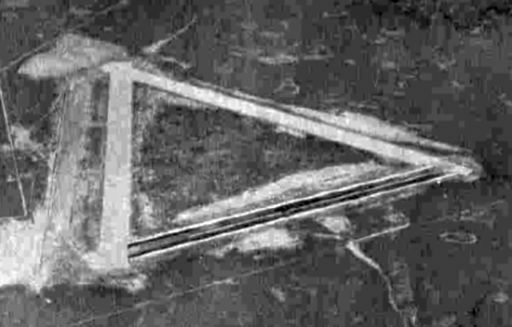 A 1960 aerial photo showed the beginnings of construction of the runway. which described the field as having a 2,000' hard-surface runway. The manager was listed as Paul Lomax, of the First State Bank. as well as a parallel taxiway & a ramp area on the northeast side of the runway. 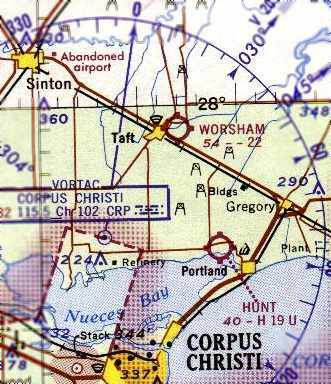 The 1975 USGS topo map depicted Aransas Pass Municipal Airport as having a single northwest/southeast paved runway, with a taxiway & ramp on the northeast side. 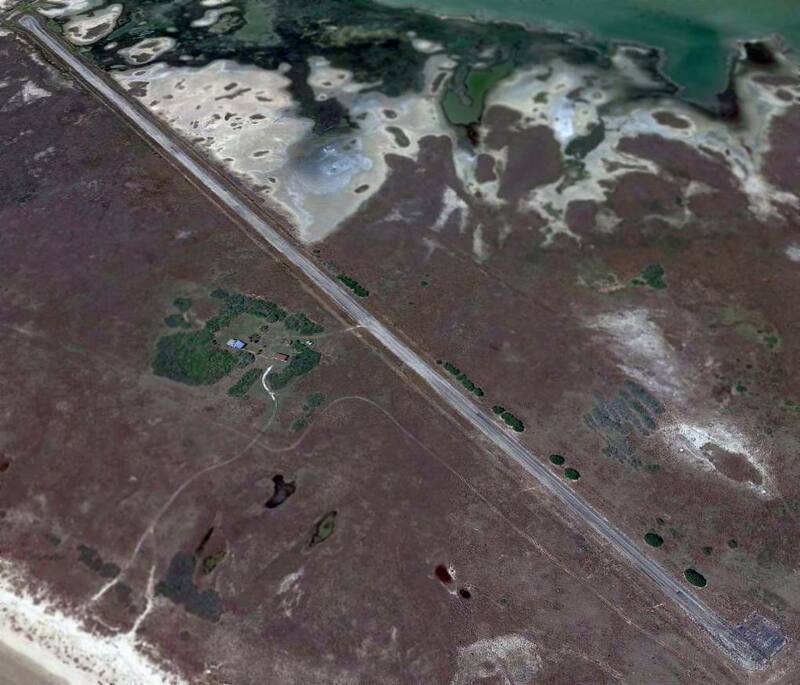 depicted Aransas Pass Municipal Airport as having a single northwest/southeast paved 3,300' runway. 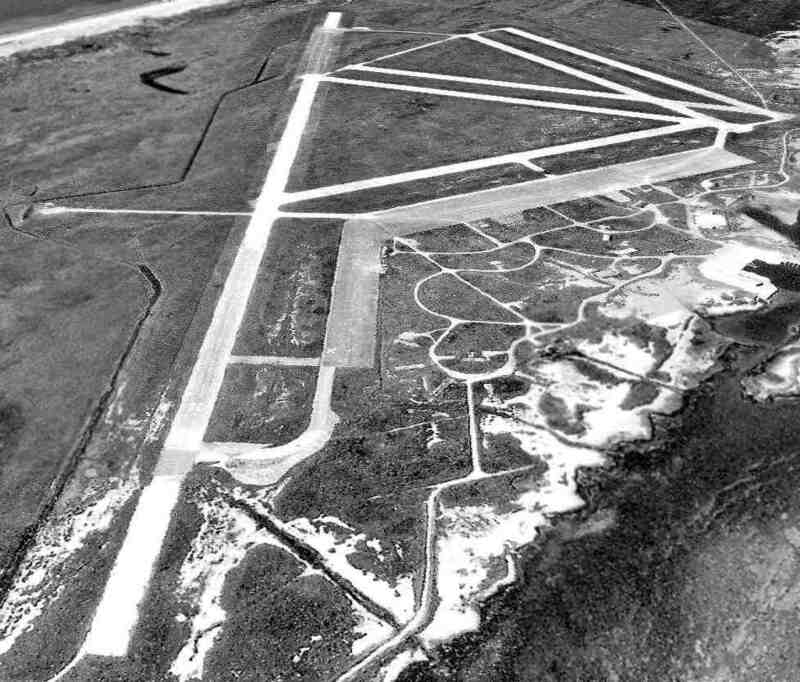 The only photo which has been located showing aircraft on Aransas Pass Municipal Airport was a 3/5/85 aerial view looking southwest. Three light aircraft were visible on the ramp on the northeast side of the field. 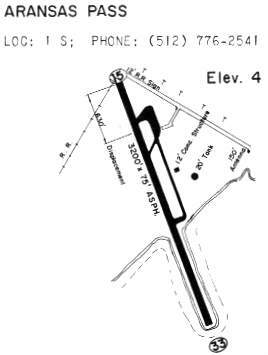 The 1985 TX Airport Directory (courtesy of Steve Cruse) depicted the runway configuration as basically unchanged. was on the June 1993 Brownsville Sectional Chart (courtesy of Ron Plante). 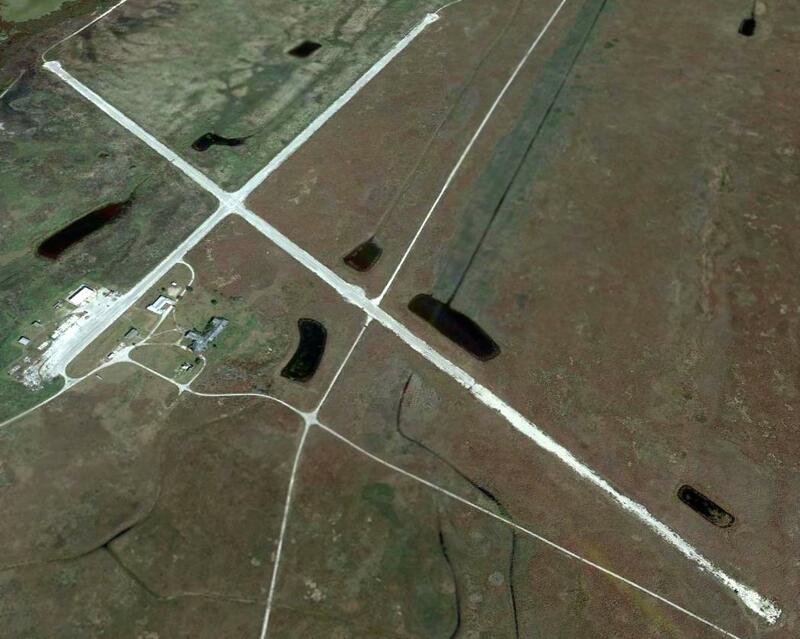 It depicted Aransas Pass Municipal Airport as having a single northwest/southeast paved 3,200' runway. 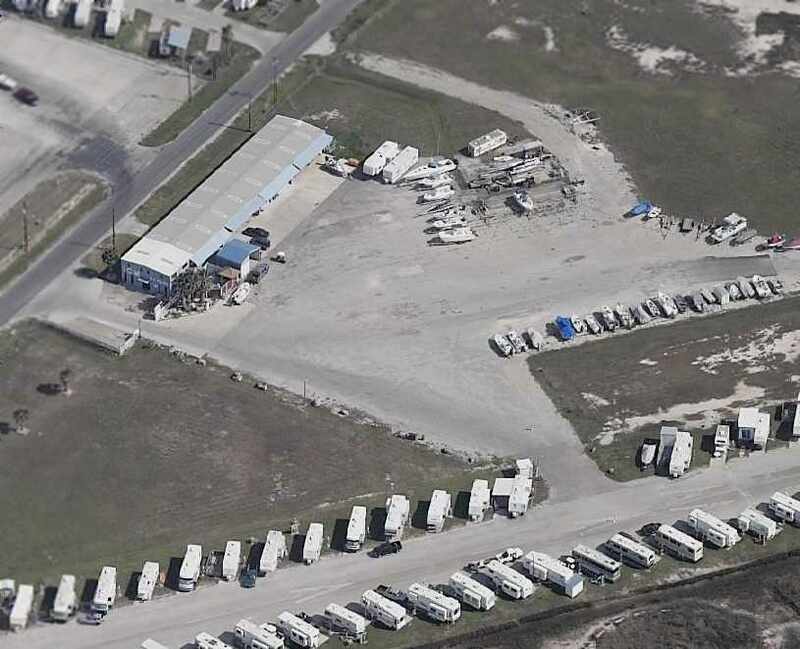 Aransas Pass Airport was still an active municipal airport up to 1996.
and the runway is now completely lined with trailer homes. 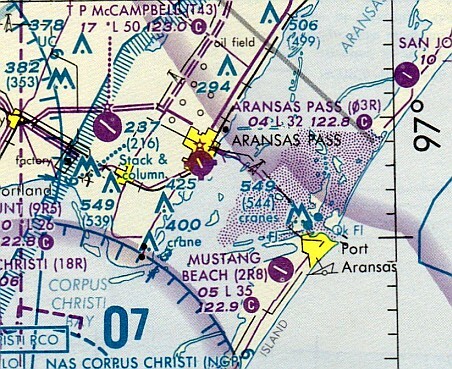 Aransas Pass was depicted as an abandoned airfield on the 1998 World Aeronautical Chart. on the ramp of the former Aransas Pass Airport. 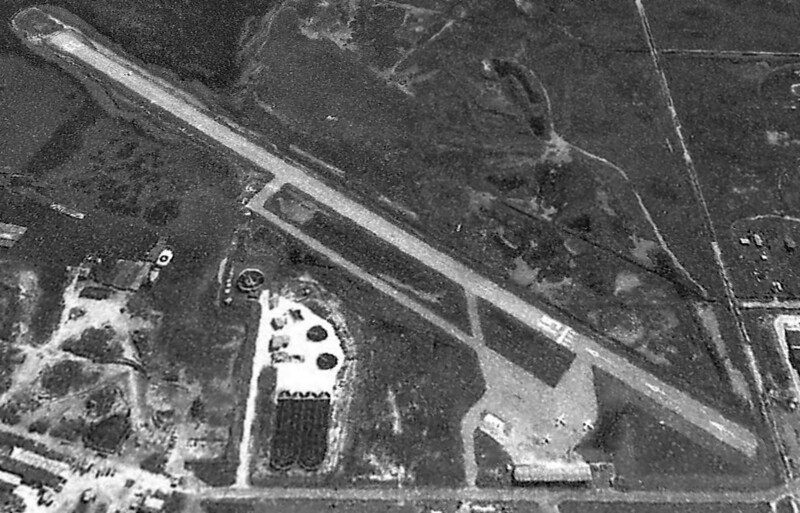 A 2017 aerial view looking southwest at the former Aransas Pass Airport showed the runway remained completely intact, lined with trailers. 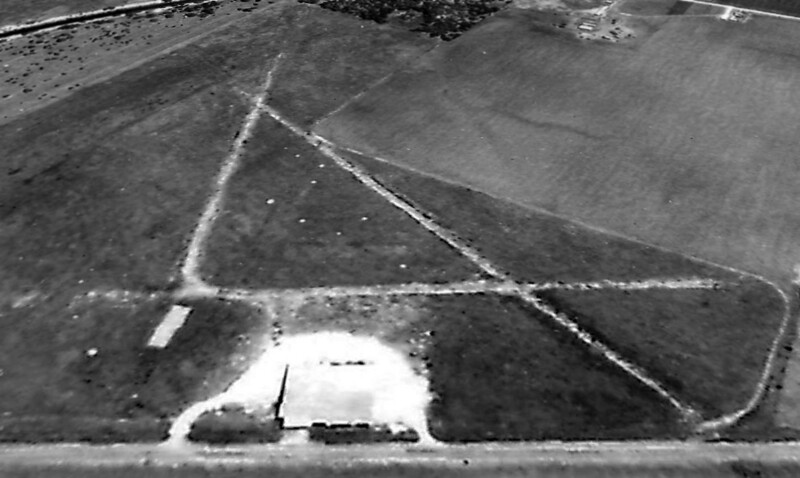 A 1949 TX General Land Office aerial view looking south at Worsham Field. as it was not yet depicted at all on the July 1943 Corpus Christi Sectional Chart (courtesy of David Brooks). was on the 1945 Edwards Plateau World Aeronautical Chart (according to David Brooks). 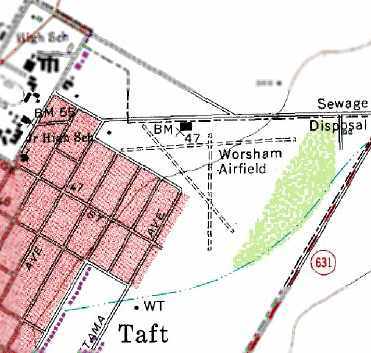 Michael Morgan recalled “the old Worsham Field in Taft... 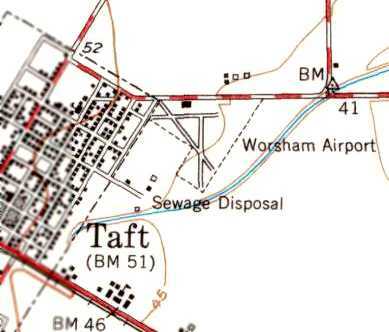 I lived in Taft 1946-54 & it was quite active. 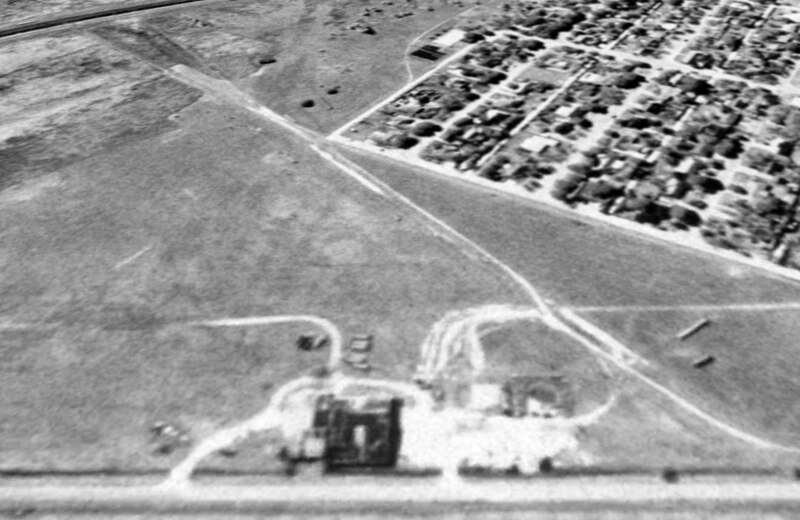 The earliest photo which has been located of Worsham Airport was a 1949 TX General Land Office aerial view. It depicted the field as having 3 unpaved runways, with a hangar on the north side. 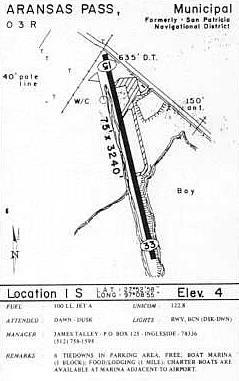 The 1951 USGS topo map depicted Worsham Airport as having 3 runways, with a hangar on the north side. A 1961 aerial view depicted Worsham Airport in an unchanged manner, but with one single-engine aircraft visible near the hangar. with the longest being a 2,200' turf strip. with the longest being the 2,200' Runway 8/26. A hangar with attached office was depicted on the north side of the field. The field was said to offer minor repairs & fuel. and the manager was listed as D.E. Montgomery. 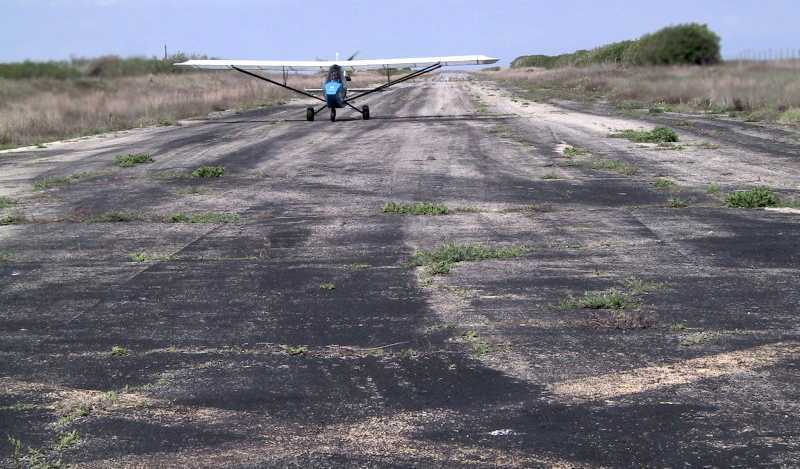 depicted Worsham Field as having a 2,200' unpaved runway. as that is hot it was depicted on the 1975 Brownsville Sectional Chart (courtesy of David Brooks). It depicted Hunt as having a 2,200' unpaved runway. with the longest being the 2,500' Runway 13/31. A single building was depicted on the north side of the field. The manager was listed as J.M. Hunt. 2,260' Runway 13/31 & 2,000' 8/26. The former Runway 17/35 had apparently been abandoned at some point between 1977-84. Three buildings were depicted on the north side of the field. was on the 1985 Brownsville Sectional Chart (courtesy of David Brooks). Hunt Field may have been closed (for reasons unknown) at some point between 1985-86.
with the hangar on the north side of the field. and the hangar on the north side of the field remained standing as well. Houses had been built adjacent to the southwest of the airfield. 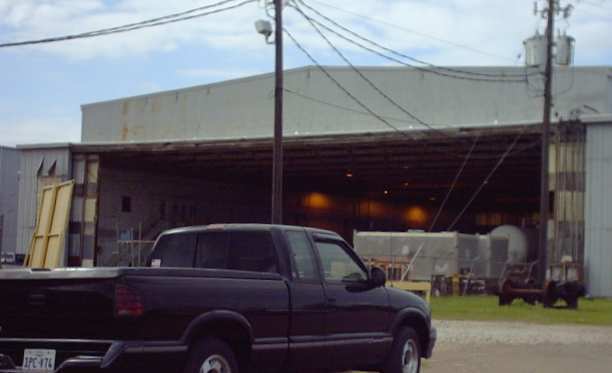 A 3/31/08 aerial view showed that the Worsham Field hangar had been removed at some point between 1995-2008.
and the foundation of the hangar remained on the north side. 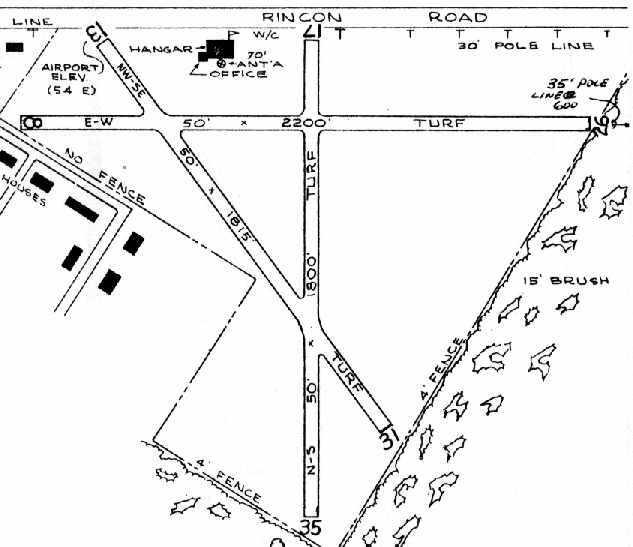 The site of Worsham Field is located southeast of the intersection of Rincon Road & Tutt Avenue. 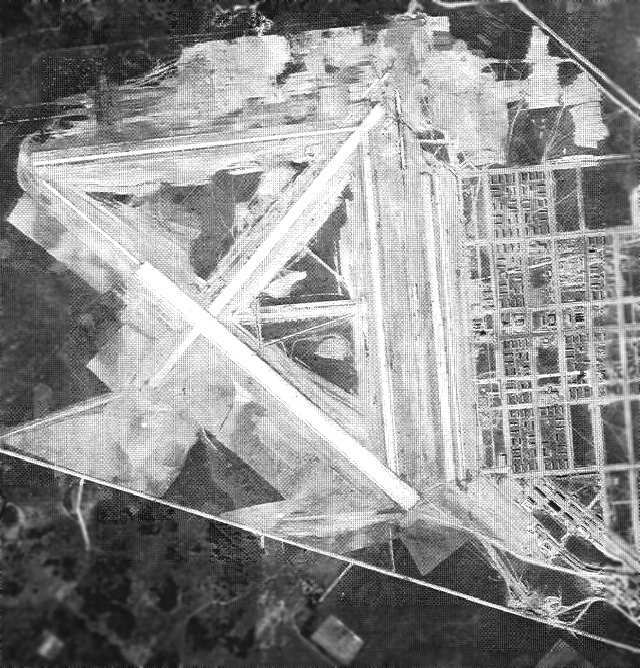 A 1942 US Army aerial photo of Aloe AAF (apparently taken while the airfield was still under construction). was opened in 1943 on a 1,909-acre tract 5 miles southwest of Victoria. 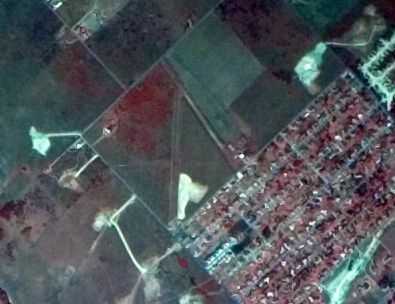 described Aloe Field as having 4 concrete runways, with the longest being the 5,600' north/south strip. and Aloe Aux #10 (7.2 miles ENE of Goliad). which relocated from Lake Charles, LA. cadets were schooled in flying & in ground & aerial gunnery. 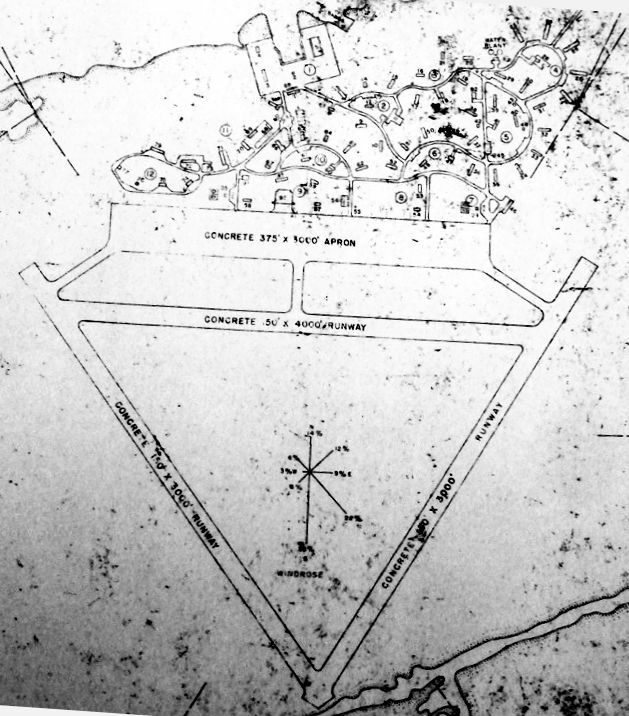 A 1943 US Army Facility Layout of Aloe AAF depicted the field as having 4 concrete runways & a large concrete apron on the east side. 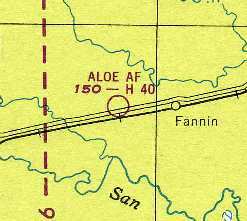 Aloe AAF, as depicted on the 1943 San Antonio Sectional Chart (courtesy of Chris Kennedy). A 10/25/43 aerial view looking north at Aloe Army Airfield from the 1945 AAF Airfield Directory (courtesy of Scott Murdock). depicted Aloe AAF as having its own control tower. but both Aloe & Foster were closed in 1945. & turned over to the War Assets Administration for disposal. after which the site became Victoria County Airport. as having a 5,600' hard-surface runway. as having four 5,000' paved runways, as well as a very large ramp with numerous buildings on the east side of the field. 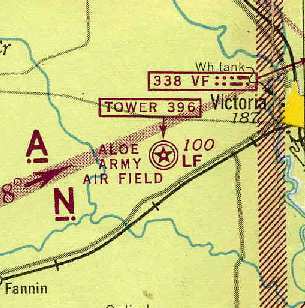 In 1960 the County Airport was moved to Foster Field, and Aloe Field was closed. 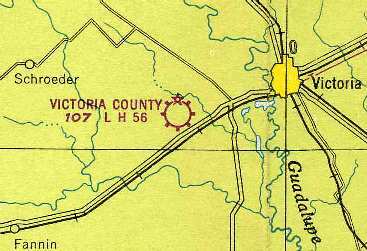 Victoria County returned the field back to the Federal Government in 1961. The base was declared surplus by the General Services Administration in 1962 & offered for sale. 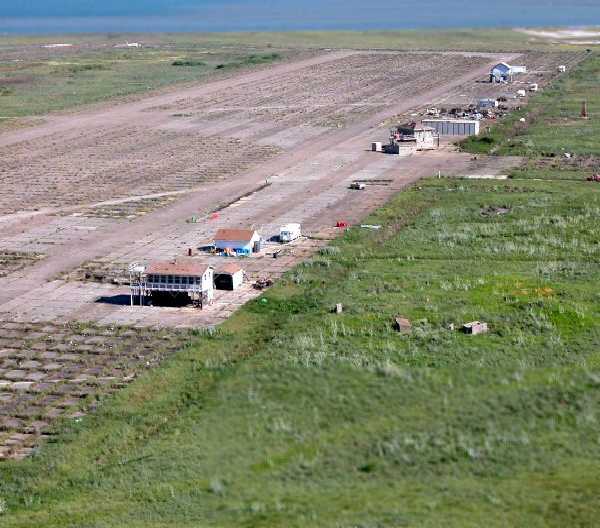 The land was broken into parcels & sold in April 1963.
to use the runway for drag races. The club could not make any permanent improvements at the property. They named the facility “Six Flags Drag Way”. although it was labeled "closed". with the longest being a 5,655' concrete runway. An undated (circa 1960s?) 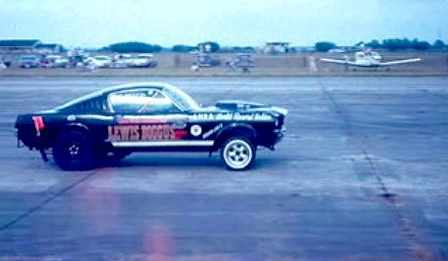 photo of a 1960s-era Mustang competing in a drag race on an Aloe runway. Note the hangar in the background at left, and a Piper or Beechcraft on the right. and named it “Six Flags Raceway Park”. In 1973 Kupfernagel sold the land & equipment. when he sold the land to a developer. The west side of the airfield (including the runways) has become an industrial park. The east side has become a housing development. just several buildings on the east side of the field. 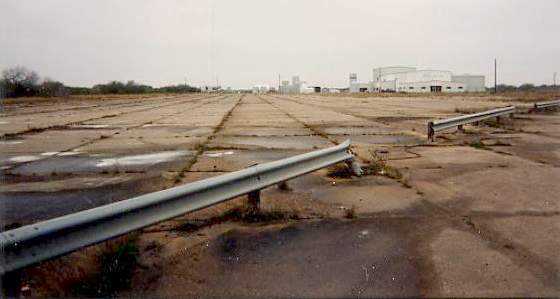 A 1990 photo by John Voss of hangars & the ramp of the former Aloe AAF. 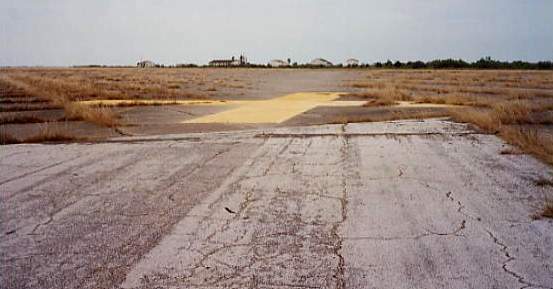 A 1994 photo by Scott Murdock of pavement of a former runway at Aloe AAF. the vast majority of which still existed. and a railroad yard had been built on the southern end of the ramp. remnants of the control tower were still visible. which is unusual for such a large airfield. right through the center of the former airfield. But large portions of 4 runways & the extensive ramp still remained intact. "I, too, was surprised that the field was not depicted on the sectional. It's been industrialized, but the field is clearly visible even from far away. is that a north/south road has been constructed that runs right through the middle of the field." A 2003 photo by Scott Murdock, who observed, "A highway now slices across the runways, and I could see part of a runway on the far side of the highway." Scott reported that the site of Aloe AAF "looked much as it did on my first visit in 1994." A 2003 photo by Erik Vela of a former Aloe hangar, now reused for fuel storage. 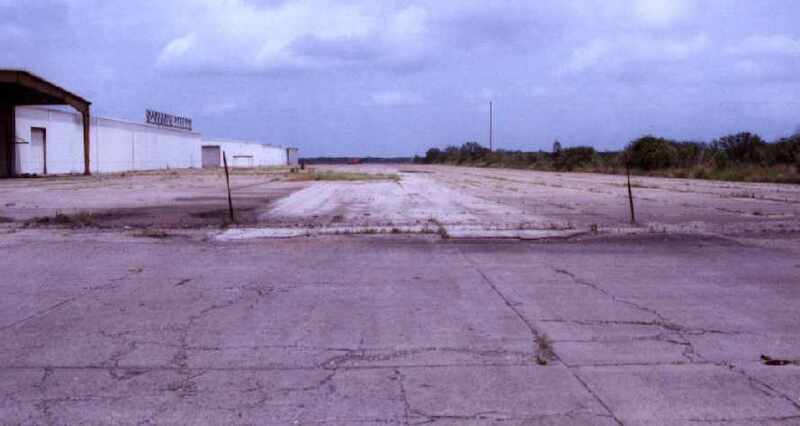 A 2003 photo by Erik Vela, looking west along the former Runway 27. 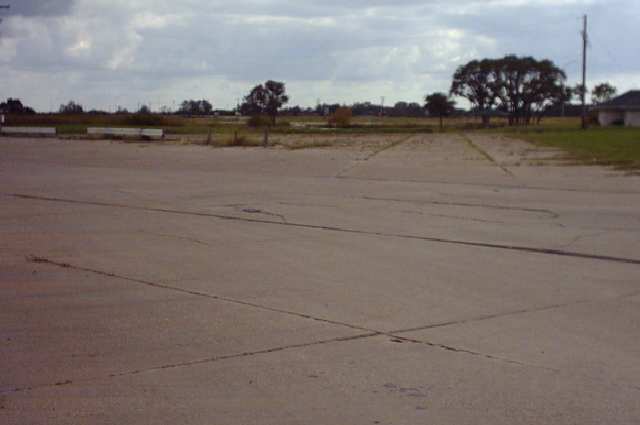 A 2003 photo by Erik Vela, looking southwest along Aloe's former ramp. A 2003 Army Corps of Engineers diagram of the WW2-era boundaries of Aloe AAF. even after being bisected by a highway. A 6/28/09 aerial view looking south showed the extensive remains of the Aloe airfield. The site of Aloe AAF is located on Route 59, near Route 175. The Handbook of Texas History Online. A 1996 Army Corps of Engineers Report. A 10/25/43 aerial view looking north at Aloe Army Airfield Auxiliary #10 from the 1945 AAF Airfield Directory (courtesy of Scott Murdock). which was a center for advanced flight training in single engine aircraft. 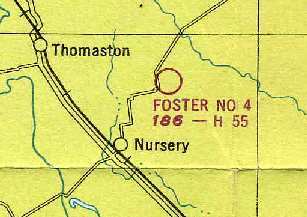 but it was depicted on a 1943 AAF map of Foster Field & surrounding airfields. described Aloe Auxiliary Field #10 as having 3 asphalt 4,000' runways. as a 943 acre “quadrangular” property having 3 concrete 4,000' runways. to be owned by the U.S. Government, and operated by the Army Air Forces. was on the July 1945 San Antonio Sectional Chart (courtesy of Chris Kennedy). 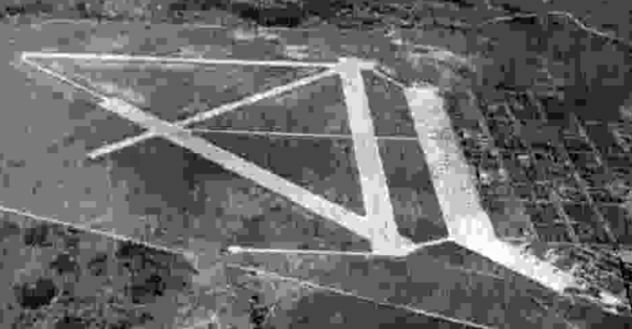 It depicted “#10” as an auxiliary airfield. was on the 1949 San Antonio Sectional Chart (courtesy of Chris Kennedy). and described as having a 4,000' hard-surface runway. The earliest photo which has been located of Aloe Aux #10 was a 10/1/59 USGS aerial view. 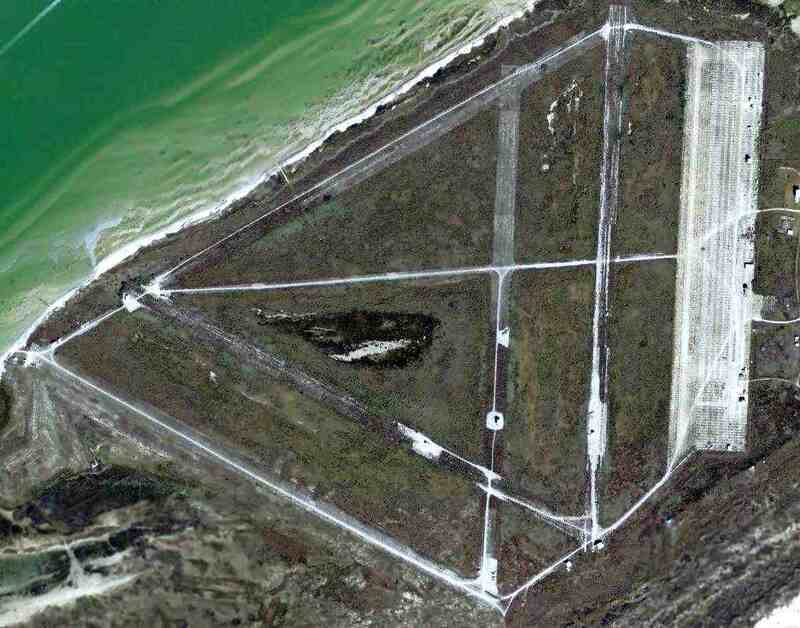 It depicted Aloe Aux #10 as having 3 paved runways, taxiways, and a paved ramp on the northeast side. Aloe Aux #10 was abandoned at some point between 1949-62, as it was labeled "Foster Field (Aban'd)" on the 1962 USGS topo map. That name may have been erroneous, as this airfield was an auxiliary of Aloe AAF, not Foster AAF. It was labeled "Aband arpt" on the 1964 San Antonio Sectional Chart (courtesy of Bill Suffa). but according to other sources, that field was located elsewhere (18 miles NNW of Victoria). and depicted it as having 3 paved runways, taxiways, and a paved ramp on the northeast side. A 1994 photo by Scott Murdock of the gate leading to Aloe Aux #10. As of 1994, the runways were being reused for open storage of industrial equipment. with three 4,000' paved runways, taxiways & a ramp. A single building was on the ramp, presumably of post-war (civilian) construction. 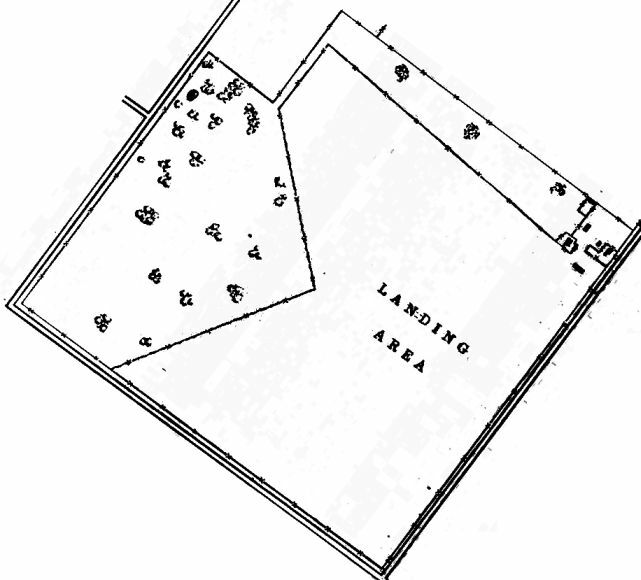 Aloe Aux #10 was still depicted as an abandoned airfield on 2003 aeronautical charts. A 12/31/08 aerial view depicted Aloe Aux #10 to remain unchanged as seen in 1995. 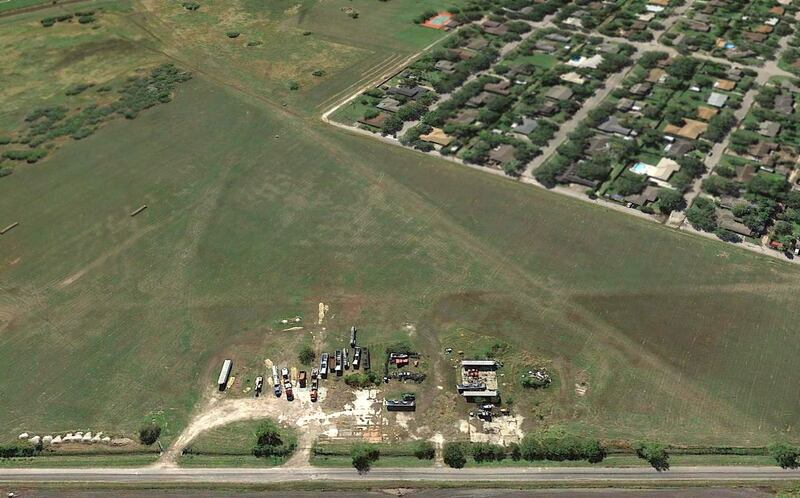 Aloe Aux #10 is located on the north side of Route 59, 7 miles east-northeast of Goliad, TX. A 10/25/43 aerial view looking north at “Foster Field Auxiliary #4 (Nursery Field)” from the 1945 AAF Airfield Directory (courtesy of Scott Murdock). The date of construction of Nursery Aux AAF has not been determined. The military property at Nursery consisted of a total of 472 acres. 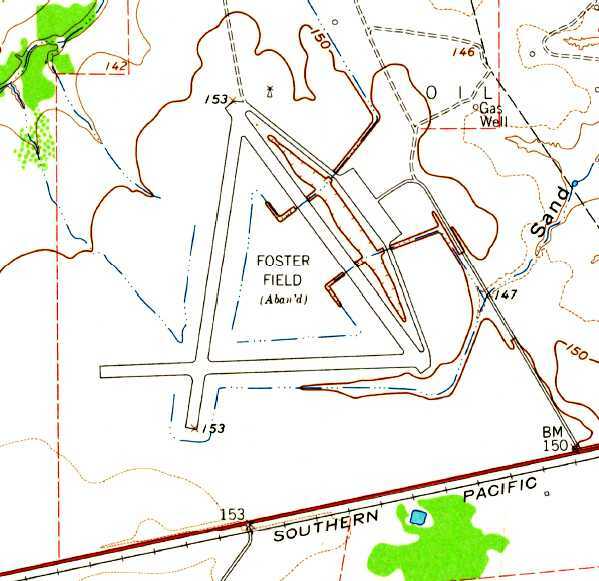 described Foster Auxiliary #4 as having 3 bitulithic runways, with the longest being the 5,540' northeast/southwest strip. 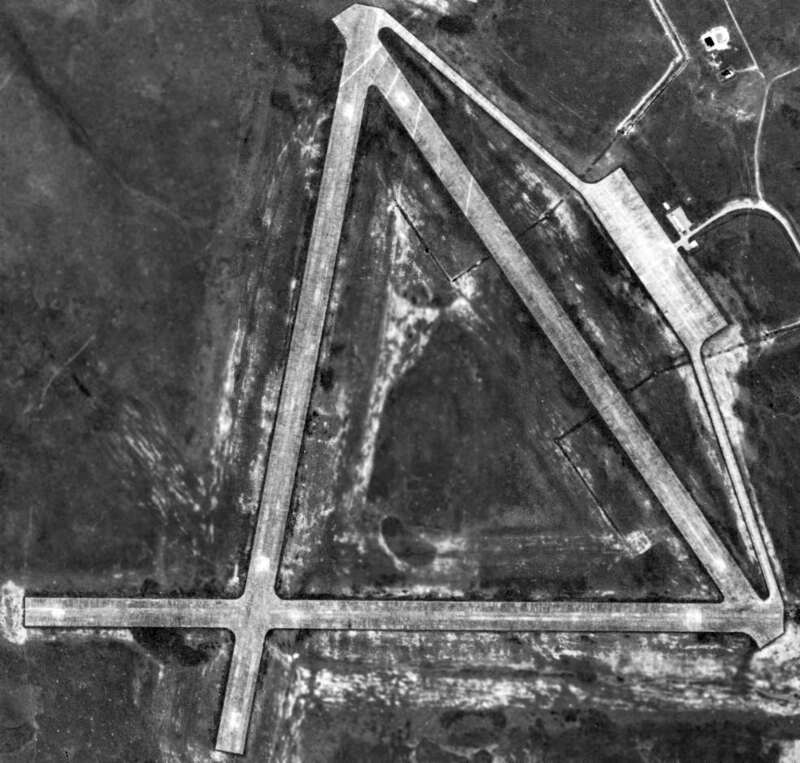 It depicted “#4” as an auxiliary airfield, around which was a circular “Danger Area”. What was that for? Was this field also used as a target for gunnery or bombing? and described as having a 5,500' hard-surface runway. 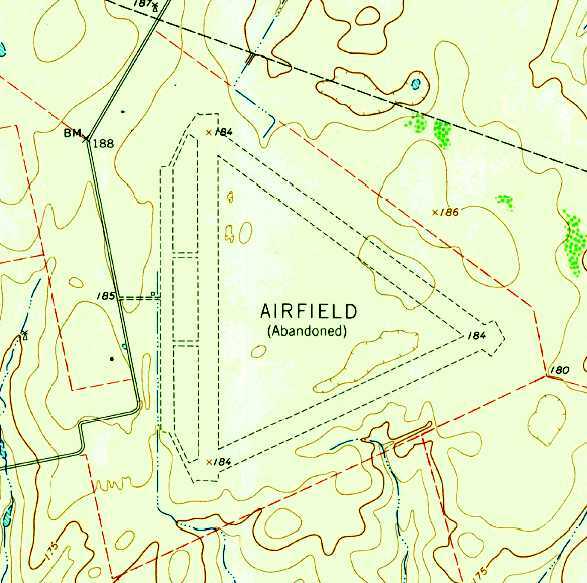 as Foster AF Auxiliary Field #1 (2129) from about 1952-58.
as it was labeled "Airfield (Abandoned)" on the 1963 USGS topo map. on the 1964 San Antonio Sectional Chart (courtesy of Bill Suffa). 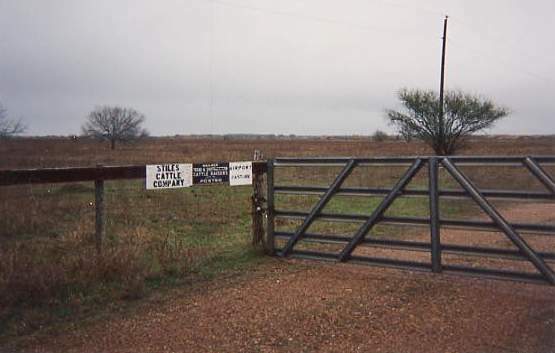 A 1994 photo by Scott Murdock of the gate which leads to the former Nursery Field. Note the sign which still says "Airport Pasture". As of 1994, the property was being used as a cattle feedlot. Giving a clue to its former life, the access gate is still marked "Airport Pasture." 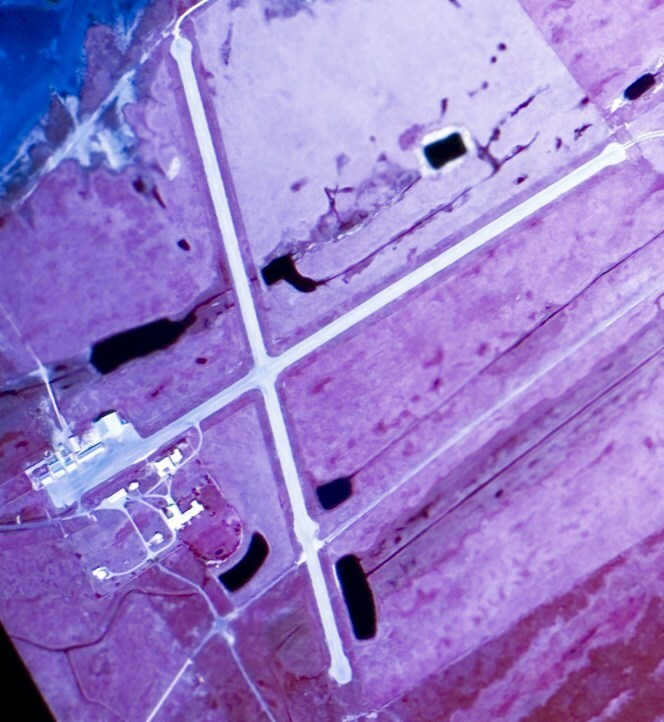 As of the 1995 USGS aerial photo, Nursery Field consisted of 3 runways (the largest is 5,400'), taxiways & a ramp. The 2 diagonal runways were barely visible, and may have been plowed over. and may have remained in use at a later date than the other two. 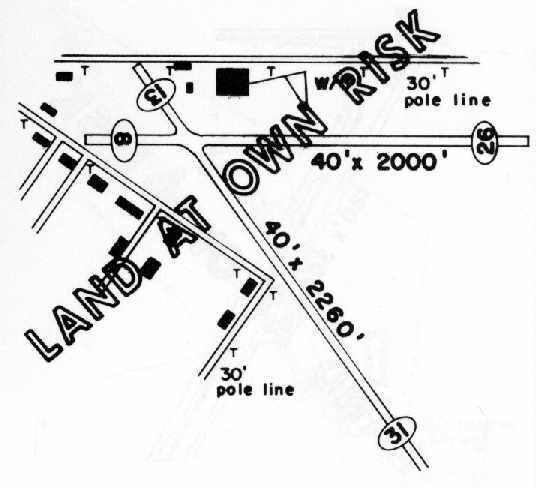 and was depicted (but labeled simply "Airfield (Abandoned)" on recent USGS topo maps. 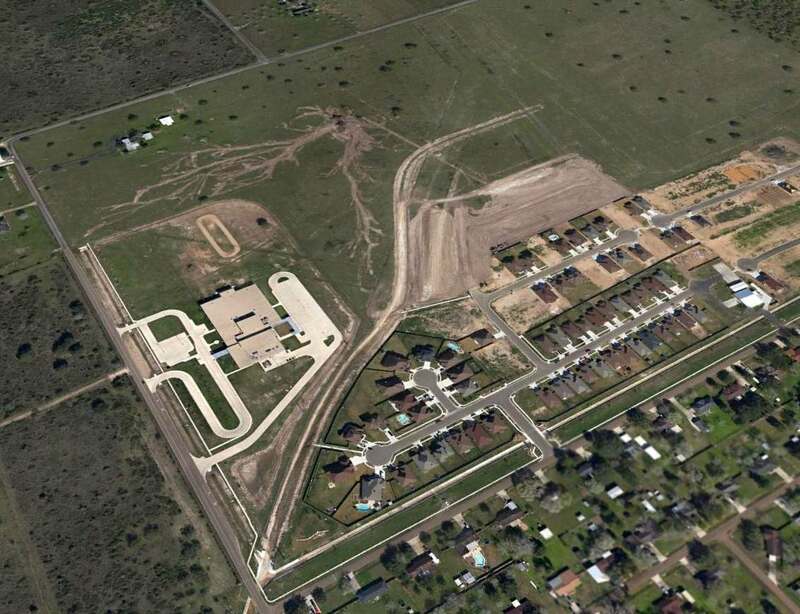 A 12/31/08 aerial view showed that Nursery Field's northwest/southeast runway had been completely removed, and replaced by several streets & houses. Traces of the southwest/northeast runway were only barely recognizable. 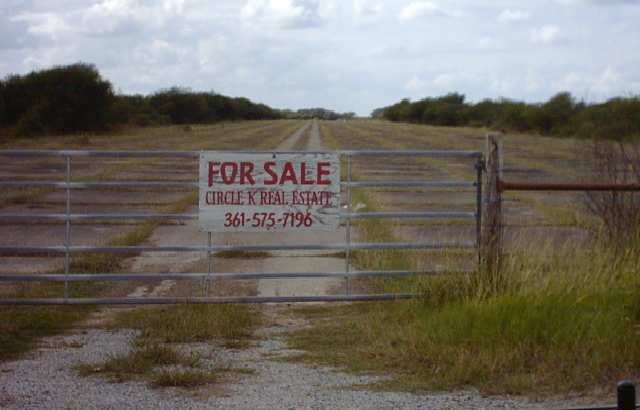 Nursery Field is located on Route 87, near Route 447, 12.5 miles north-northwest of Victoria, TX. A 1942 depiction of the planned Matagorda Island Army Airfield (from the TX State Archives, courtesy of Ron Plante). was a 1942 depiction(from the TX State Archives, courtesy of Ron Plante), which evidently depicted plans for the yet-unbuilt airfield. It depicted 3 concrete runways, with the east/west runway being labeled as 4,000', whereas the other 2 runways were labeled as only 3,000'. Note that this is geometrically impossible for the depicted equilateral triangle shape. A complex set of curved roads was depicted on the north side of the large concrete apron. which conducted air-to-air & air-to-ground gunnery training. described Matagorda Island as having 3 asphalt runways, with the longest being the 4,000' northeast/southwest & northwest/southeast strips. 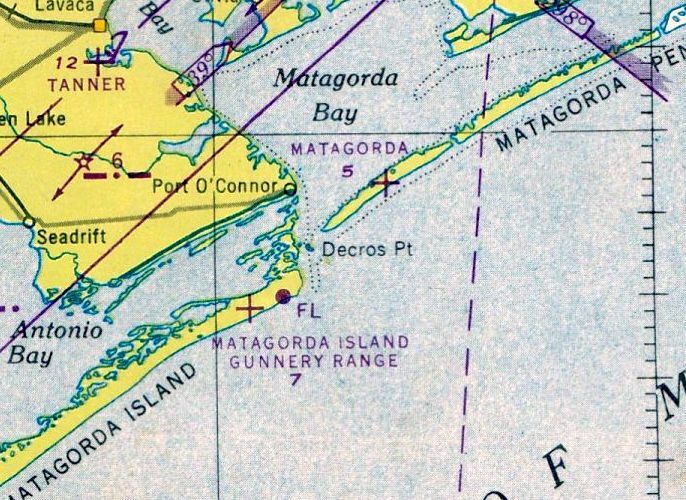 The airfield was labeled as "Matagorda Island Gunnery Range"
on the 1943 San Antonio Sectional Chart (according to Chris Kennedy). 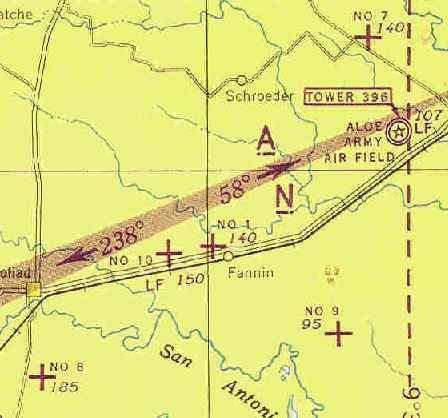 The airfield was reactivated as an Air Force Base for the Strategic Air Command in 1949.
was on the January 1947 Edwards Plateau WAC Chart. 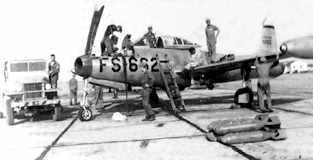 It was depicted as an auxiliary airfield. and described the field as having a 4,000' hard-surface runway. a large ramp, and a large number of streets & buildings. 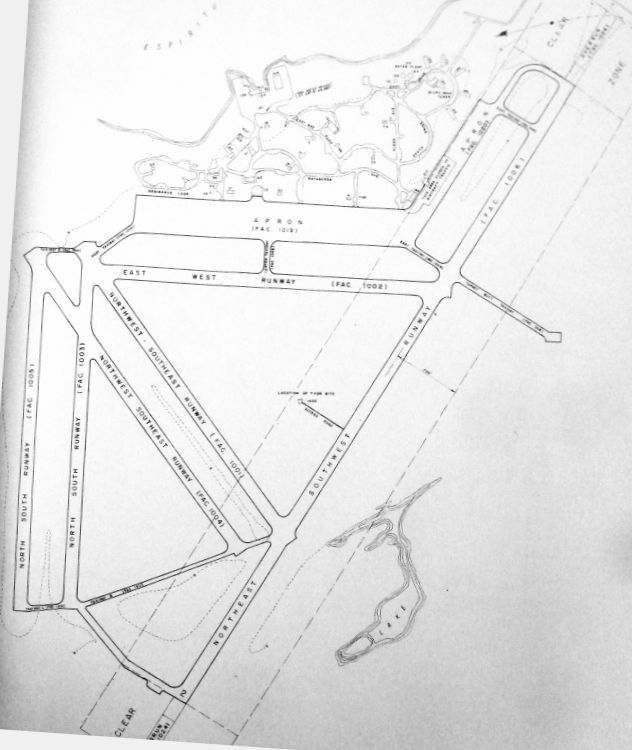 In addition to the number of runways doubling since the 1942 depiction, the northeast/southwest runway had been extended to almost double its length. from “The Story of the 184th/127th Kansas Air National Guard, 1941-86" (courtesy of Todd Greenberg). A 1957 photo by Norman Foote of the welcome sign for Matagorda Island Bombing & Gunnery Range. and a rescue helicopter (model unidentified) in flight above them. A 1957 photo by Norman Foote of an Air Force McDonnell F-101A (or 101C) Voodoo fighter making a high speed pass below the top of the Matagorda Island's range control tower. A 1957 photo by Norman Foote of an Air Force McDonnell F-101A (or 101C) Voodoo pulling up after a strafing run at Matagorda Island. Note the dust still in the air behind the target immediately below the fighter. A 1957 photo by Norman Foote of an Air Force Sikorsky (model unidentified) landing at Matagorda Island Bombing & Gunnery Range to take him back to Foster AFB. shows that the northeast/southwest runway had been extended again (this time to the southeast) at some point between 1952-60. Carswell AFB, Bergstrom AFB, Chennault AFB, and Barksdale AFB. 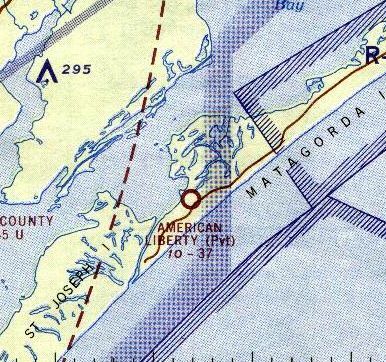 Matagorda Island AFB was depicted as an active airfield on the 1964 San Antonio Sectional Chart (courtesy of Bill Suffa). its own control tower, VOR beacon, and NDB beacon. 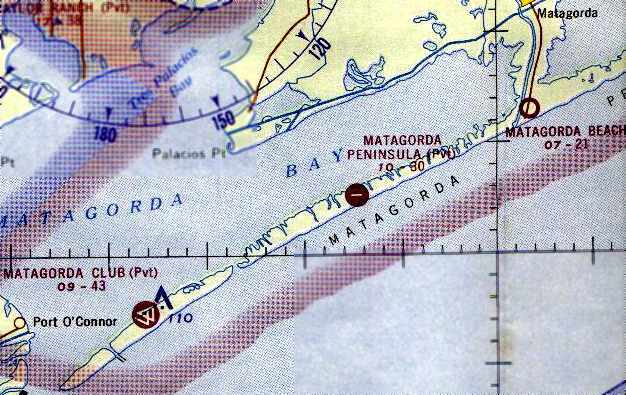 "Matagorda Island AF", as depicted on the 1966 Edwards Plateau WAC Chart (courtesy of Robert Brown). Matagorda Island AFB was deactivated in 1975. At some point after 1975 the property became a federal wildlife refuge. In the 1980s & 1990s, Matagorda Island was used as a location for the Tethered Aerostat Radar System. 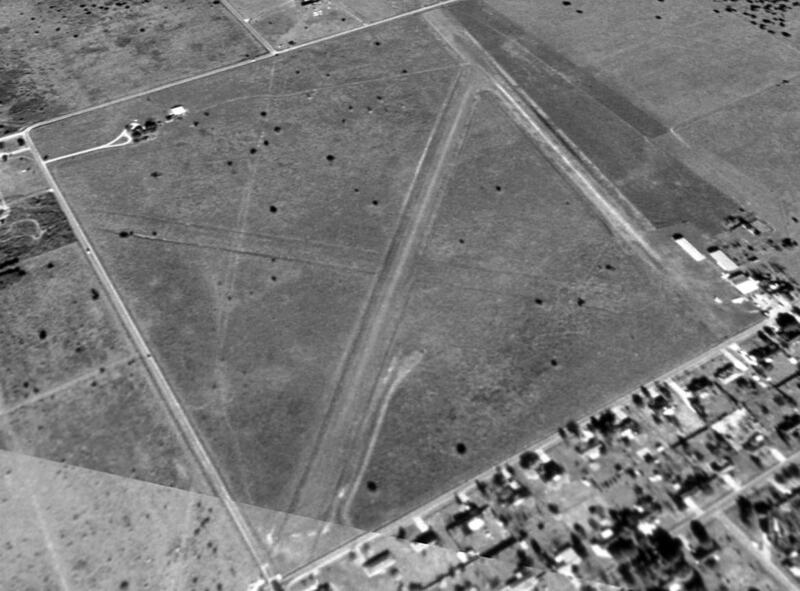 The earliest photo which has been located of the entire Matagorda airfield was a 1990 USGS aerial view looking southwest. Note that runway numbers had been painted at some point on Runway 2/20, but then closed-runway X symbols had been added. Short portions appeared to have been repaved with asphalt at either end of that runway, of which the total length of the paved surface is 10,800'. 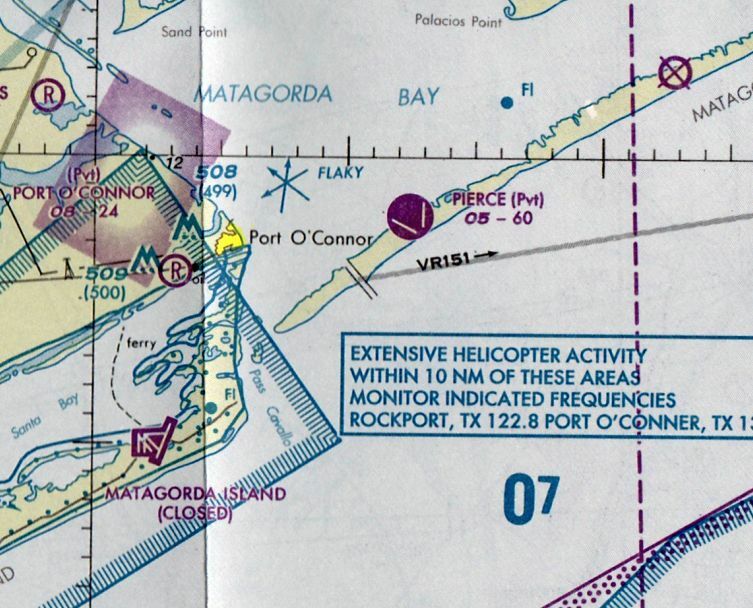 The Matagorda airfield was depicted as an abandoned airfield on 1990s aeronautical charts. 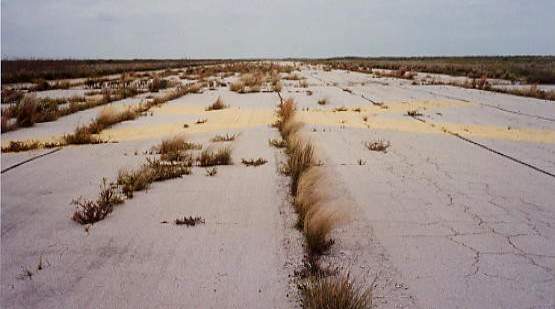 A series of 1994 photos by Scott Murdock of the remains of the Matagorda runways. A 1994 photo by Scott Murdock of the remaining military buildings at Matagorda. 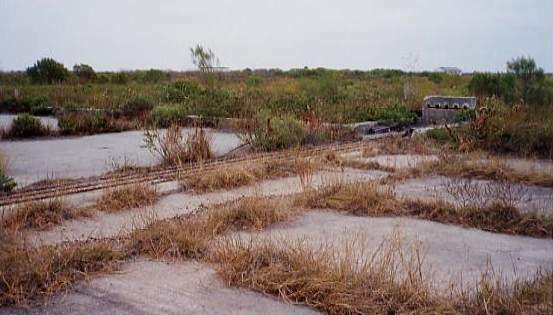 A 1994 photo by Scott Murdock of the foundation of a former hangar at Matagorda. 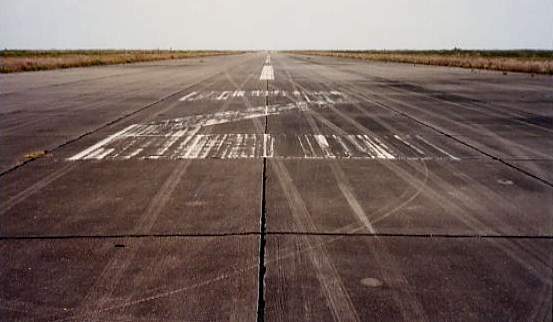 "The longest runway still has visible markings on it & is in relatively good condition. The tarmac & taxiways also still exist but have weeds growing everywhere. There are also foundations remaining from some of the hangars." 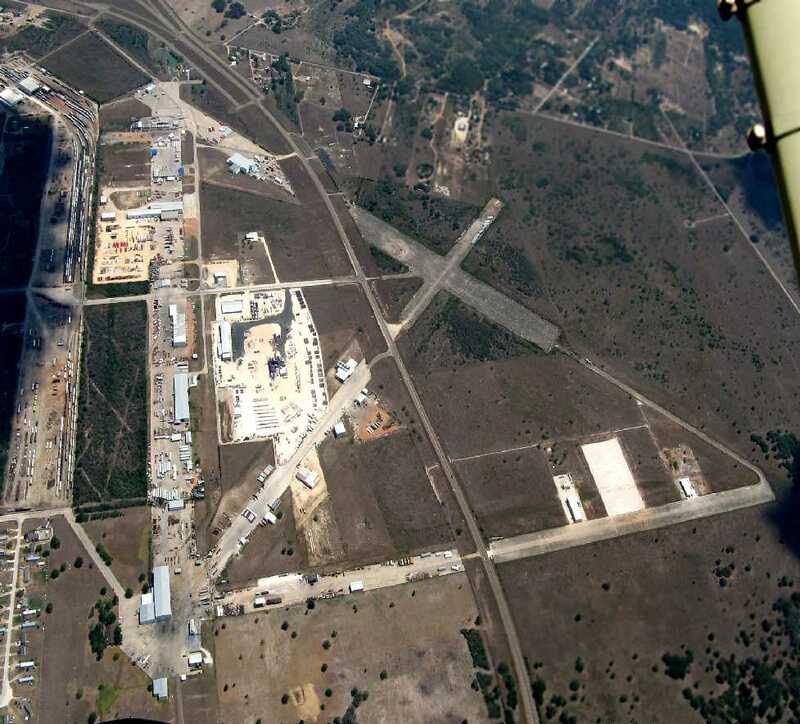 A 2009 aerial view looking north at the massive Matagorda AFB airfield by Hector Zuniga. A 2013 aerial view looking south shows the massive Matagorda Island AFB remains intact though deteriorated. 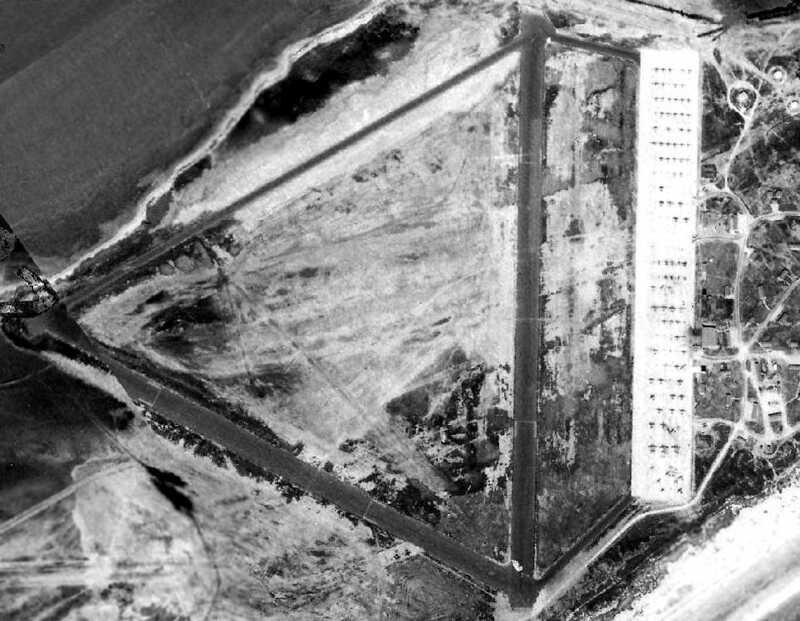 A 3/5/43 aerial view depicted over 100 aircraft on the Matagorda Peninsula AAF ramp. 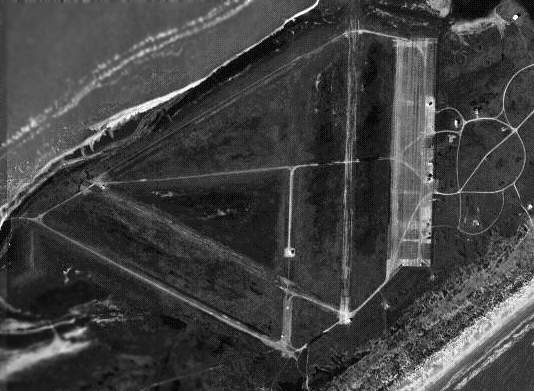 This military airfield was constructed along a narrow island on the Gulf of Mexico. and was a sub-base of Foster AAF. described Matagorda Peninsula as having 2 asphalt 4,000' runways. 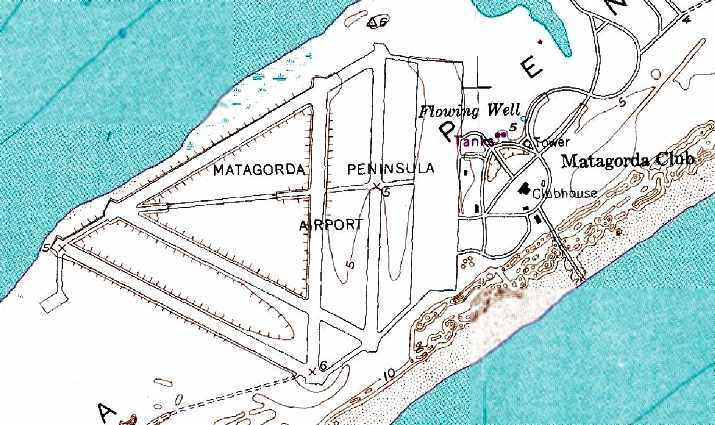 labeled the airfield as "Matagorda Peninsula (Central Fixed Gunnery School)". with 2 asphalt runways connected by a taxiway. A large concrete ramp on the east side held an amazing array of over 100 aircraft. A series of curved roads on the east side had dozens of buildings. At some point after 1943 the airfield gained 2 more runways, bringing the total up to 5 runways. 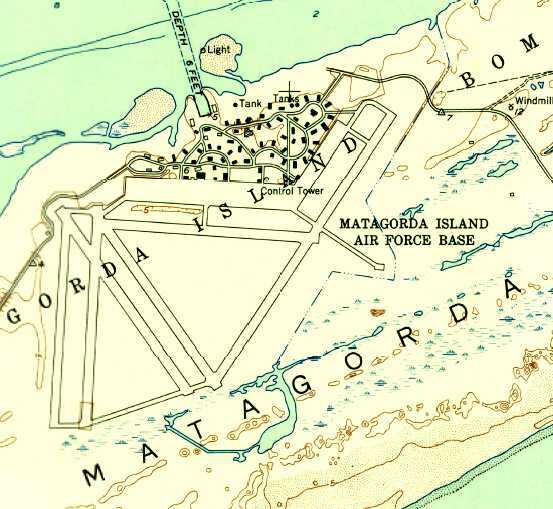 It depicted “Matagorda” as an auxiliary airfield. 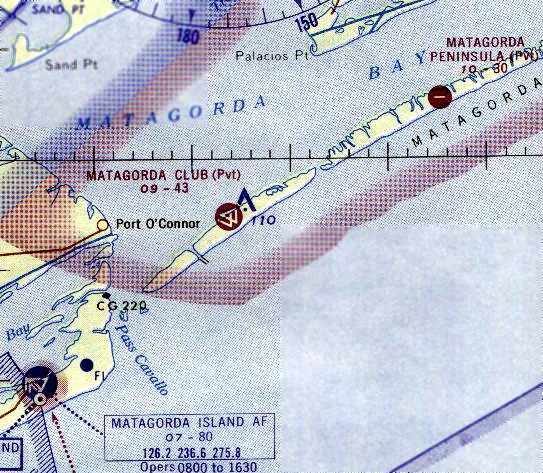 It was labeled "Matagorda Club" on the 1964 San Antonio Sectional Chart (courtesy of Bill Suffa). with a total of 5 runways (the longest was a 4,285' asphalt runway). before they settled on Cape Canaveral. According to Bill Heddrick, “In 1981, Space Services began setting up operations at the Pierce Field location & had built the launch pad [shown in the photo below]. The rocket itself (Percheron) was being built in California by a company called GHC, owned by Hudson. learned about what was being planned & decided they did not want a rocket launched in their back yards & began the process of seeking an injunction. 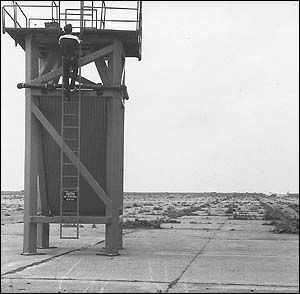 A circa 1981 photo of a Space Services Inc. employee climbing the Percheron rocket launch tower on the Matagorda Peninsula ramp. 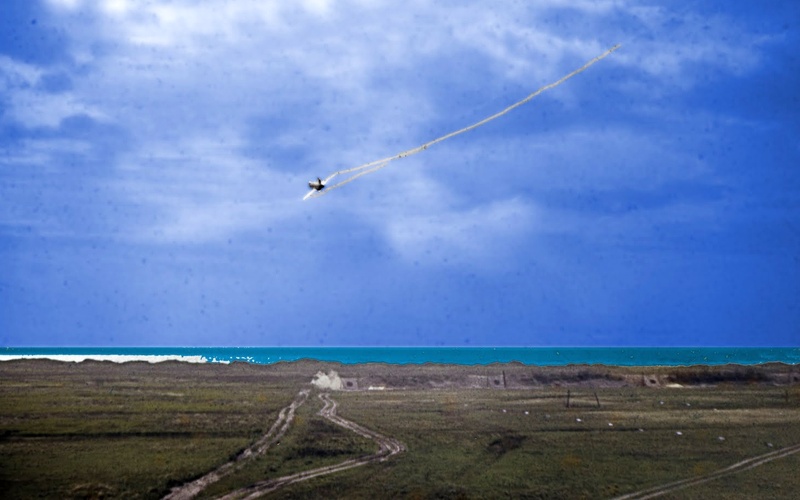 a Houston-based company which used Matagorda Peninsula as a launch site for their commercial space rockets. the world's first privately funded mission to reach space. 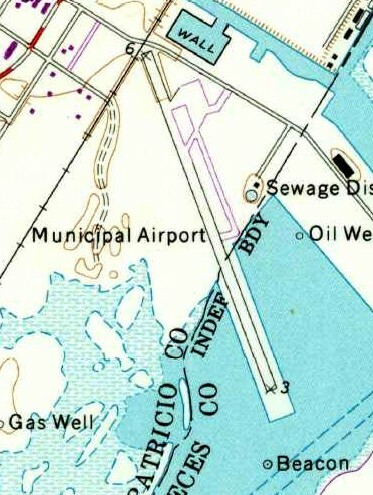 No active airfield was listed at the site in the 1982 AOPA Airport Directory. after landing at the abandoned Matagorda Peninsula AAF. He flew in "to spend the day on the beach. It turned out to be one of the most enjoyable days of my life. cowpatties & weeds were littering the surface." He said that they had the beach to themselves - "Blue water, white sand... nice." as having a total of 5 paved runways, with a large paved ramp on the east side. The property adjacent to the east side of the airfield was labeled as the “Matagorda Club”. 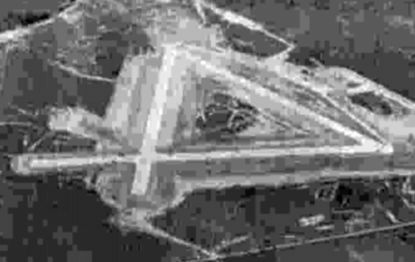 As seen in the 1995 USGS aerial photo, the former Matagorda Peninsula AAF includes 5 concrete runways, taxiways & a large ramp. 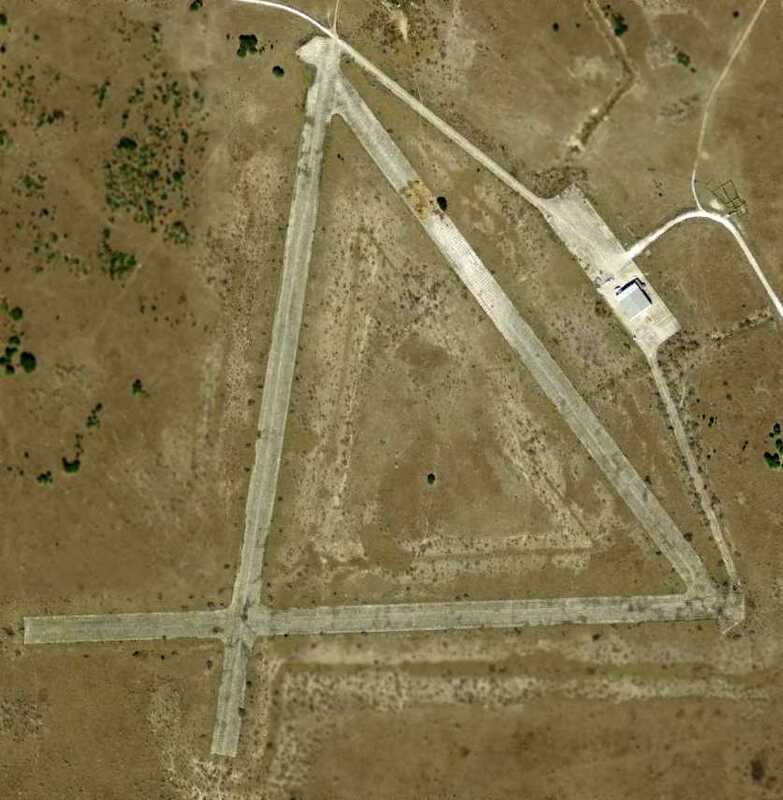 From at least 1998-2002, the airfield has been reused as a private airfield, Pierce Field. Two runways were still maintained (the longest, 6/24, is 6,000'). with the longest being 6,000'. A 2003 aerial view by Robert Laird looking northwest at several houses built on stilts over the western edge of the Pierce Field ramp. "I've flown over this field many times, and more than once I've seen Cessnas parked there. The field looks in very bad shape, so whoever lands there is a true cowboy. Today, I noticed a new-looking windsock." A 12/31/08 aerial photo showed the remains of the 5 runways, taxiways & large ramp. as structures that appear to be RVs & trailer homes are spaced out evenly among all of them. Only the tarmac seems to be clear of them & in good shape, its concrete is nearly ash black with age however. I saw no buildings in the way of hangars, towers, water towers or other 'military' looking structures left at all. 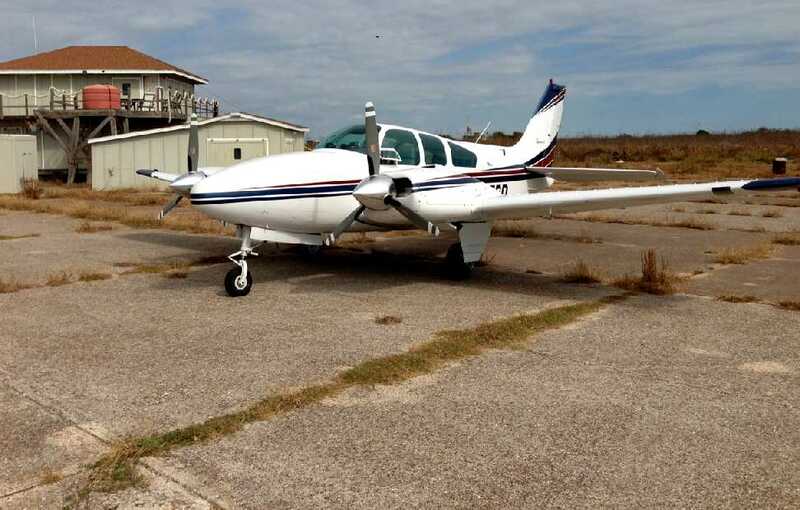 A 2012 photo by James Adams of his Beech Baron at Matagorda / Pierce Field. James reported, “I landed there late last year. Privately owned but land owners are selling undivided interests in acreage. Bill Heddrick reported in 2015, “Pierce Field is owned by Aaron Pierce who lives in Kemah, TX. It is a private facility & permission is required to land there. 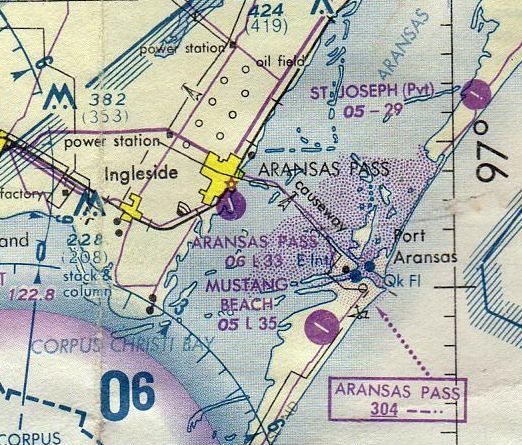 Matagorda Peninsula Airport, as depicted on the 1964 San Antonio Sectional Chart (courtesy of Bill Suffa). 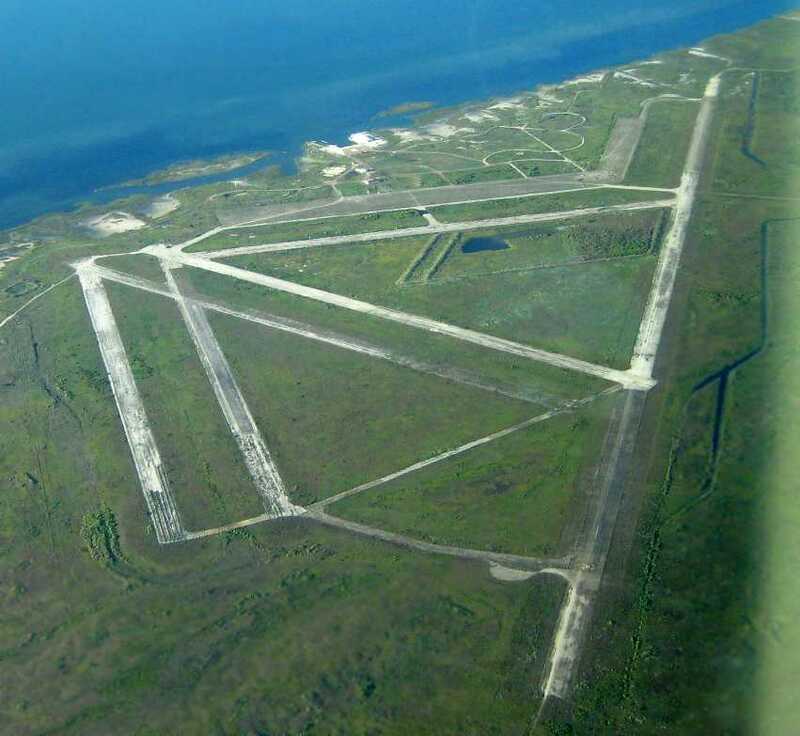 This airfield is located along a narrow island on the Gulf of Mexico. as it was not depicted at all on a 1943 aerial photo nor on the 1949 San Antonio Sectional Chart (according to Chris Kennedy). is the 1964 San Antonio Sectional Chart (courtesy of Bill Suffa). 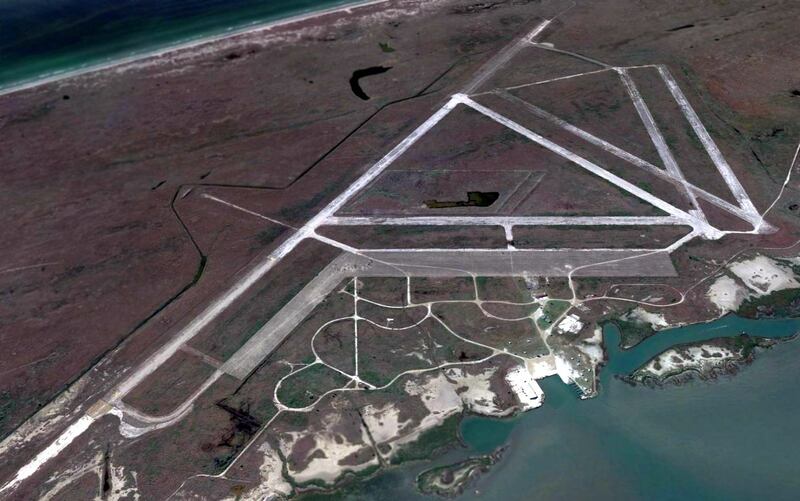 It depicted Matagorda Peninsula as a private airfield with a single 3,000' asphalt runway. and it was described as having a single 5,100' asphalt Runway 8/26. 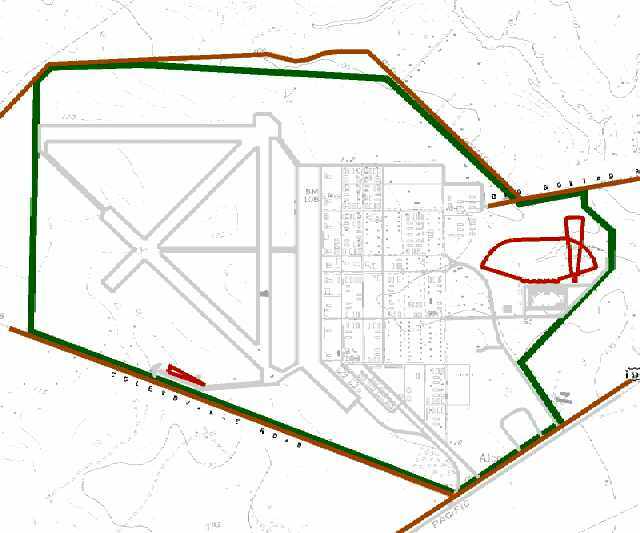 to consist of a single 5,100' asphalt runway & a small ramp area with 2 small buildings. owned by the Cullen family (a wealthy Houston oil family) for many decades. Horn landed at Matagorda Peninsula in the late 1990s during acquisition talks. 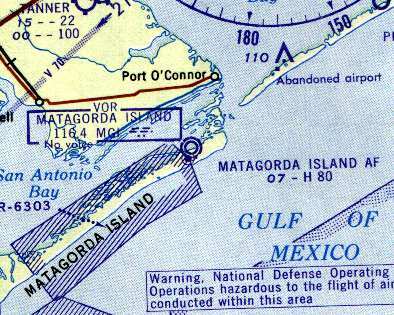 Matagorda Peninsula Airport was depicted as an abandoned airfield on 2002 aeronautical charts. 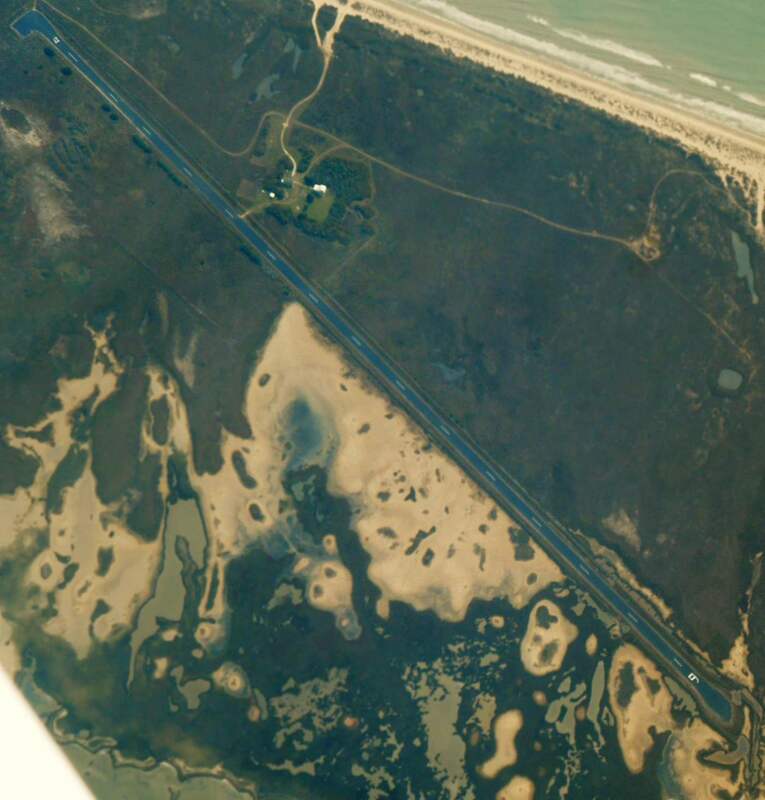 An April 2002 aerial view by Robert Laird looking southwest at Matagorda Peninsula Airport. An April 2002 photo by Robert Laird of an ultralight after landing at Matagorda Peninsula Airport. "I flew over Matagorda Peninsula Airport. This field looks like it's in very good shape." 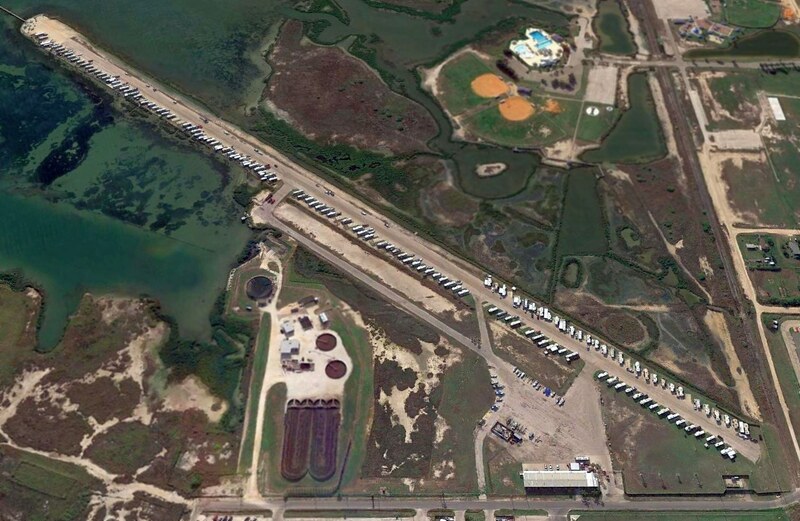 A 3/25/13 aerial view looking northwest showed the Matagorda Peninsula Airport to remain intact. A 6/18/14 photo of a Cessna Citation VII on Matagorda Peninsula Airport. 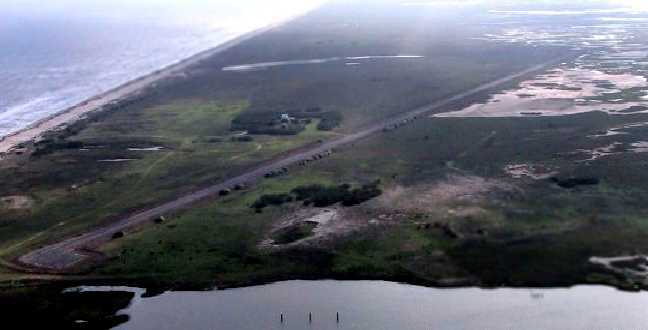 A 1/15/15 aerial view by Trevor Mitchell looking southeast at Matagorda Peninsula Airport. 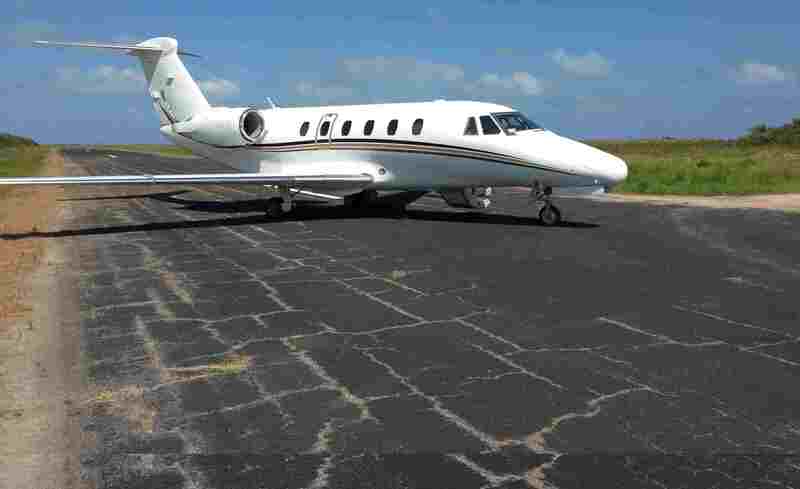 Trevor noted, “I noticed that the Matagorda Peninsula Airport had been recently repaved & given fresh markings.